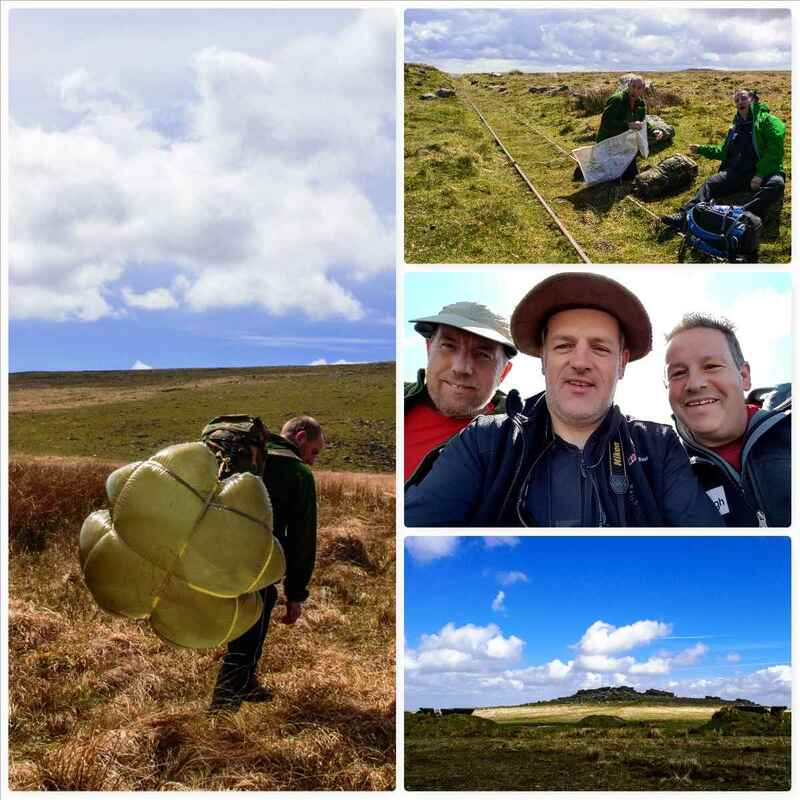 It was time for Dartmoor again in early May (seems like a second home to me these days) with some of my fellow Sea and Royal Marines Cadets instructors. The weather was great but as usual Dartmoor threw up a few surprises. We were staying at the salubrious accommodation that is Okehampton Army Camp (I can sense the shivers running down the spines of certain readers as we speak) however this time we managed to bag the officers quarters as we were the first to arrive. I was joined initially by my friends Graham and Perry before the rest of the gang arrived in the evening. The view from my billet was great as the whole of North Moor was visible. 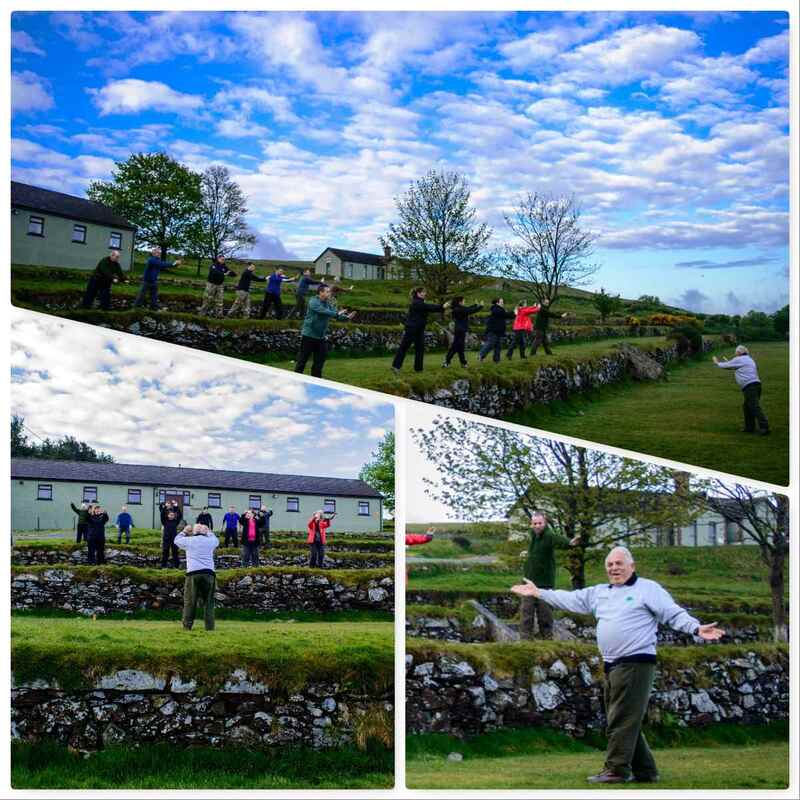 First thing on Saturday morning our most senior of instructors Alan Lewis took everyone out to loosen up with a bit of Tai Chi. It was short and to the point but the setting was fantastic. Alan swears by Tai Chi and it sure keeps him active. After breakfast it was time for some classes. 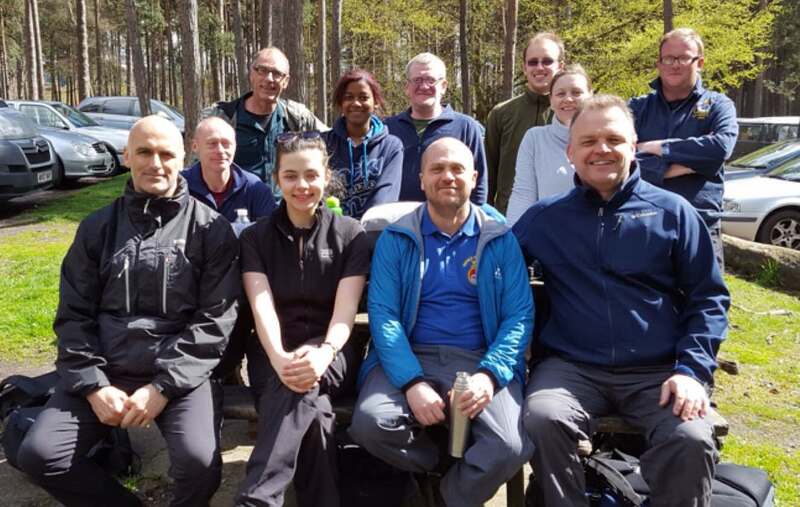 We were joined by fellow instructors Dave Lewis, Chris Bonfield and Ben McDonald along with some of this years Basic Expedition Leader students. 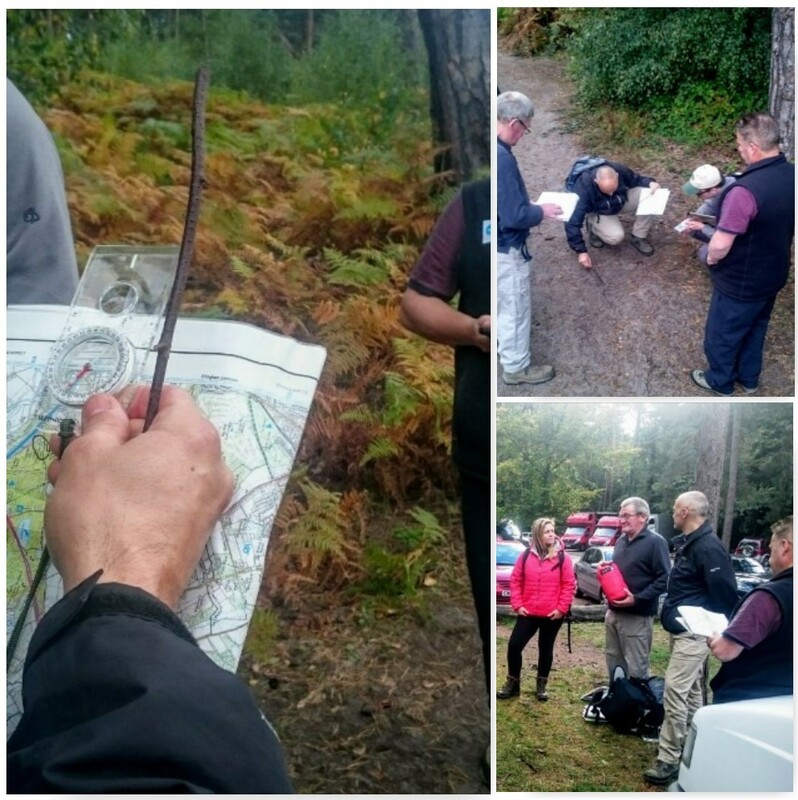 The focus for the Saturday was on navigation and group leadership. The weather held well and we met up with each of the groups as we went along. 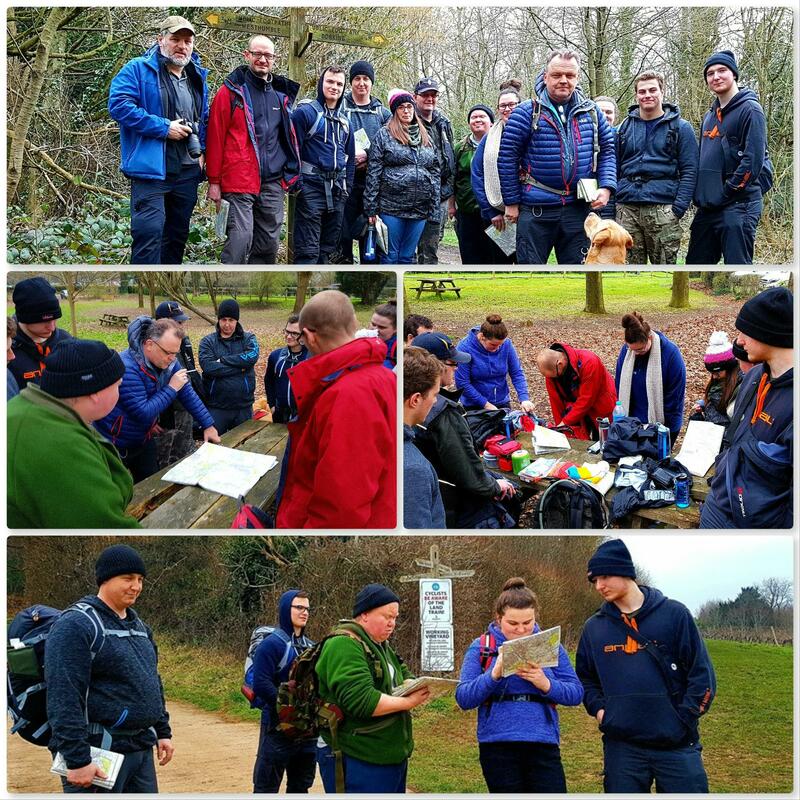 Everyone got time to practice their navigation and group leadership with a few scenarios thrown in for good measure – I must thank Ben, Chris and Dave for all this as they did all the work – so cheers guys. Much can be said about the beauty of Dartmoor with its Tors and dramatic skies but you do need to remember where you are. Along the way we passed numerous shell holes with the odd rusting casing lying around. Also there were the odd pile of spent rounds that had not been cleaned up but there can be live ammunition found. We spotted lying nestled in the grass a live grenade (looked like one from the new grenade launchers mounted on vehicles). I took a quick snap with full zoom and we logged its position on the GPS so as to report its position back at the camp. Remember the rule of leaving everything well alone on Military Training Areas. 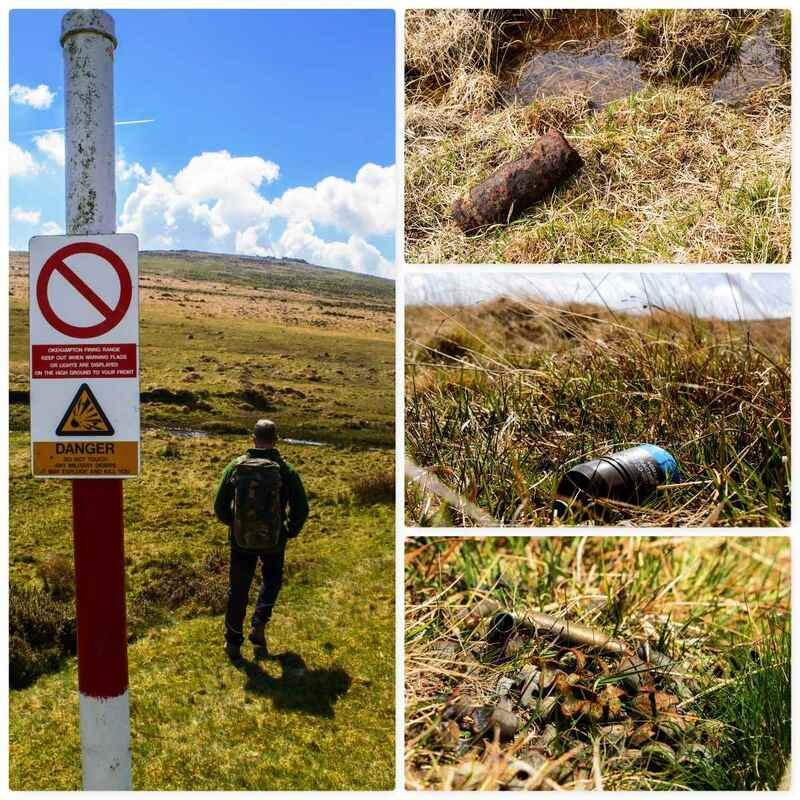 Nature has it hard as well out on the moor – mind you the frog I spotted sunning itself looked happy. It had been raining really hard the day before (you can see the amount of moss on the roof) and one little lamb had crawled into a crack in the rocks to shelter but did not make it through the night. We also found part of a lambs leg lying in the grass – it was very fresh as so I assume it made for a tasty meal for some predator. 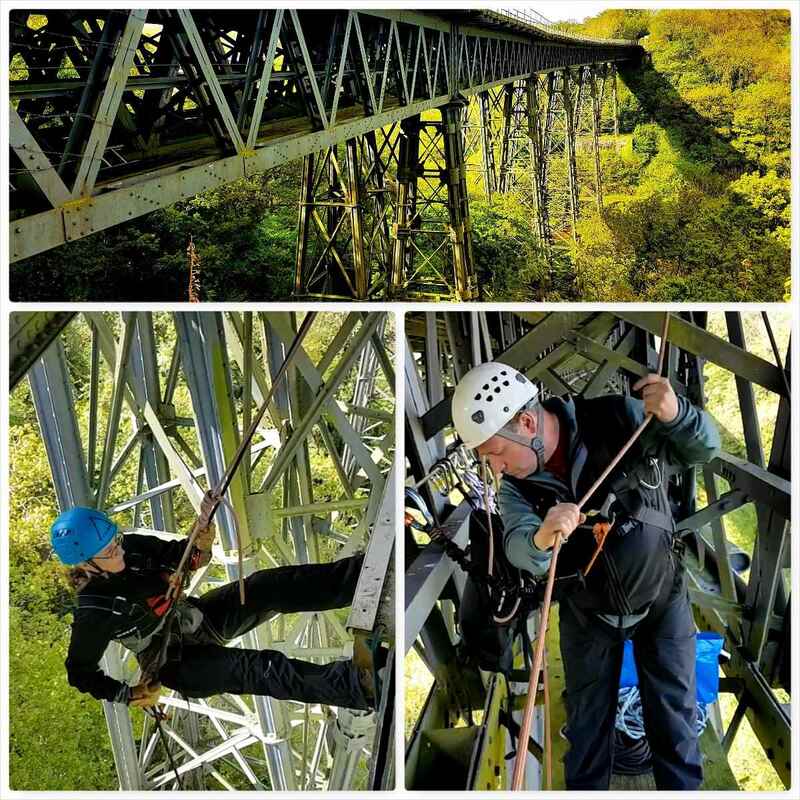 Sunday morning brought us back to Meldon Viaduct (regular readers may remember this from two years ago) for our abseil – known as ‘The Big Oke‘ Abseil. 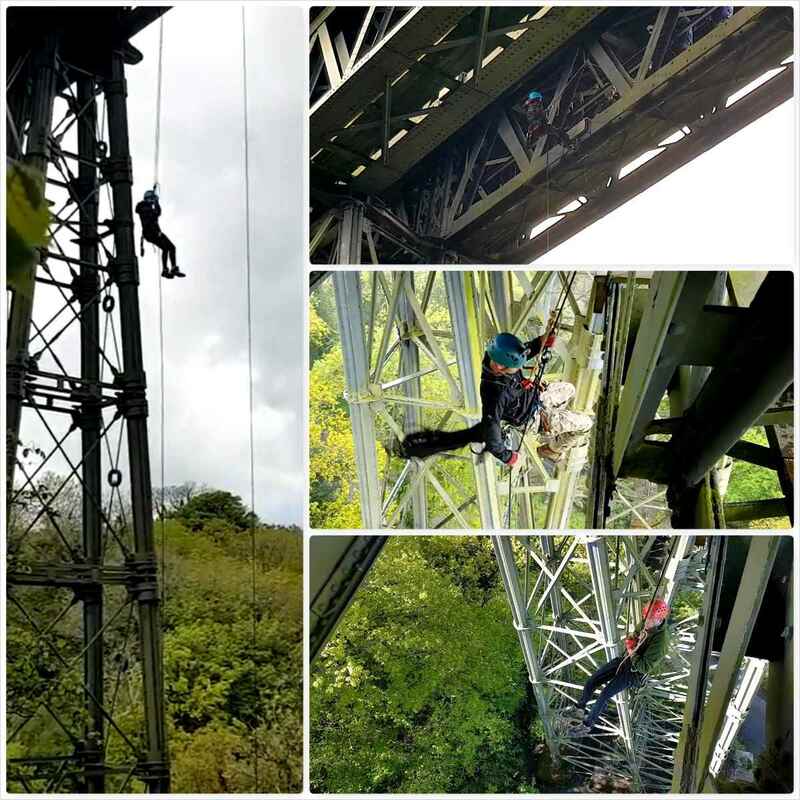 It is a cracker of a drop – a 100 foot free fall abseil. Perry an Graham set up the ropes and we were soon away. For some this was the first time they had abseiled and it is one to remember. The last time we were there the weather was atrocious so we could not drop from the centre but this time the weather was kind to us and the views were great. The drop made for a cracking video. 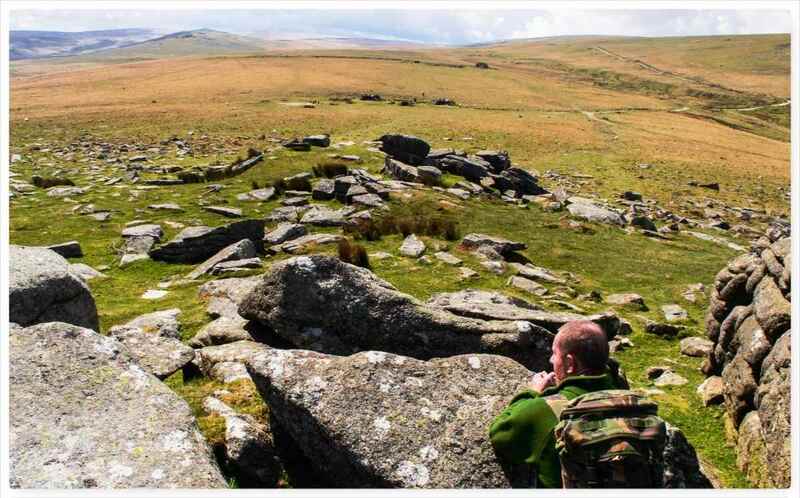 As I said Dartmoor is like a second home to me (just come back from a Gold DofE training expedition on the moor) so I am looking forward to getting back down there soon. Life is all hustle and bustle at times – so when it is you need some time out. 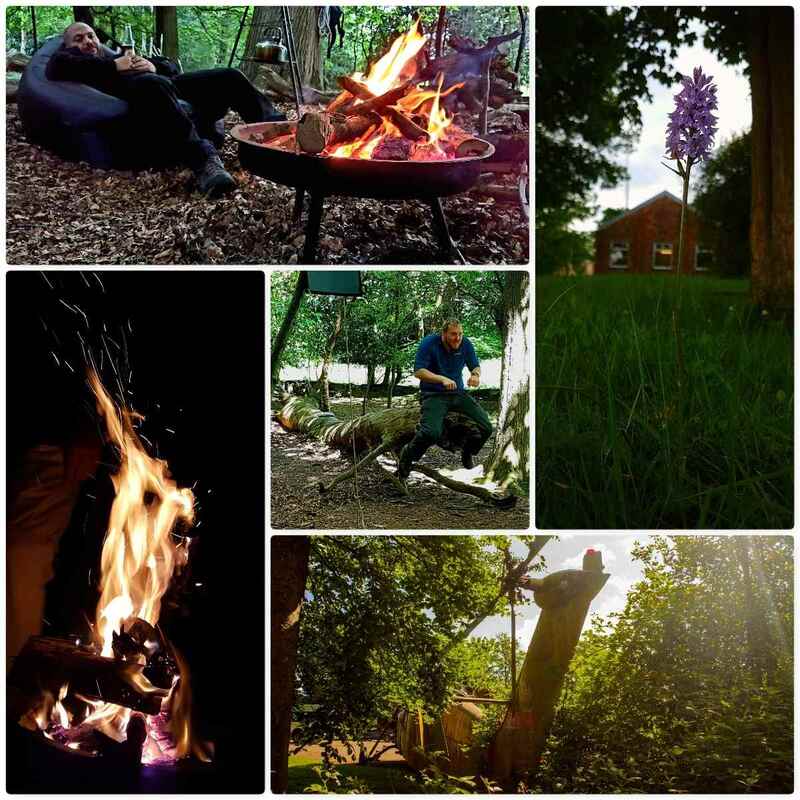 A great place for this time out can be found at the Field Farm Project. Our friends Mollie and Nick run this project and I feel as if I have entered a different world when I pop into visit. They certainly live up to their business tagline: Grow – Study – Make. 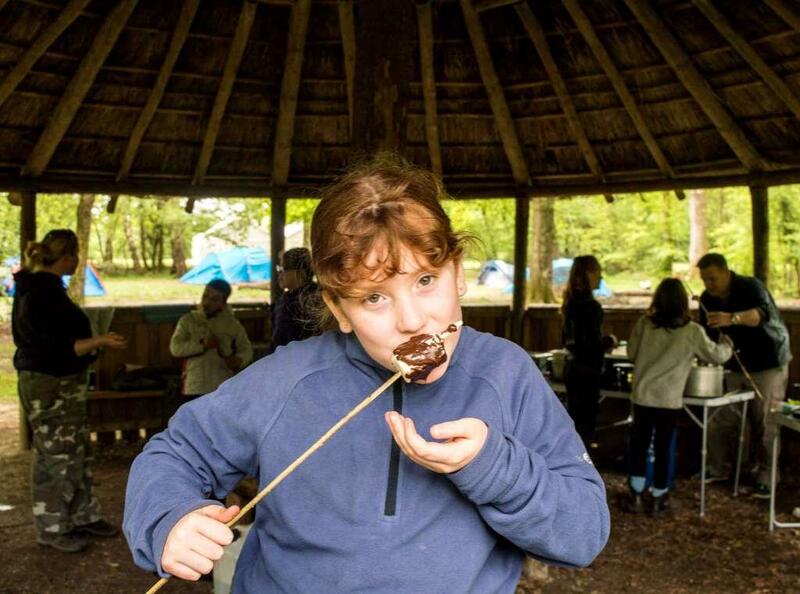 I met Mollie on a Bushcraft instructor course at Woodcraft School and part of the course was to undertake the Basic Expedition Leadership (BEL) award. I did not do this part of the course as I was already a qualified Mountain Leader however as I run this BEL course myself now Mollie wanted to do a bit of a refresher on her navigation as she runs lots of outdoor classes. Along for the day’s training as well was my wife Alison, daughter Catherine, Mollie’s friend Debbie and her young son. It was a lovely sunny day but with the northerly wind it was bitterly cold at times. Before setting off we were fortified by some hot home-made celeriac/parsnip soup with a side of freshly baked breadsticks. 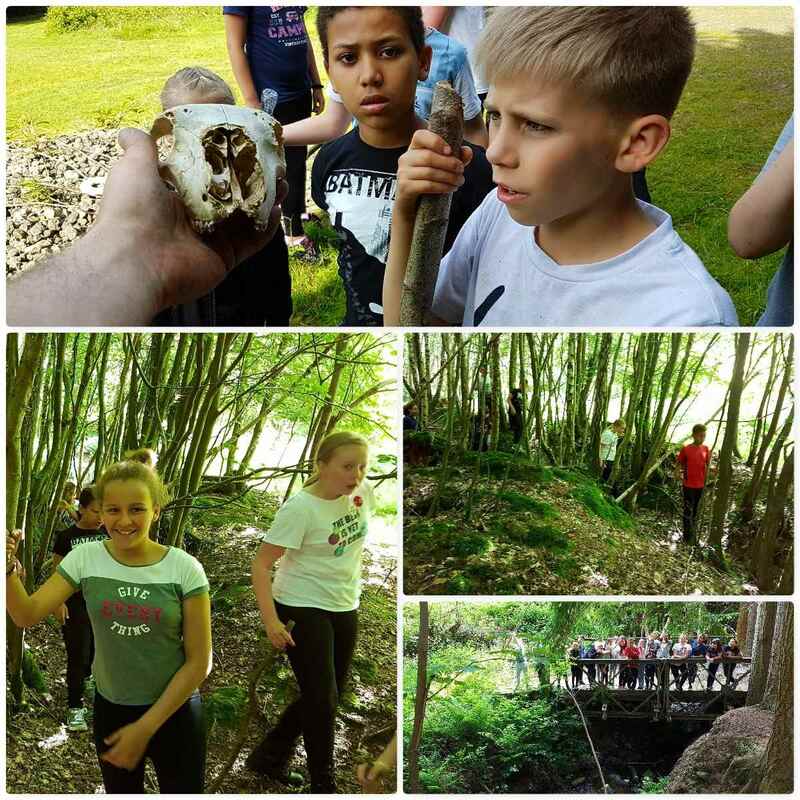 It was not all map and compass work (though there was a fair bit of it), we had lots of fun along the way. 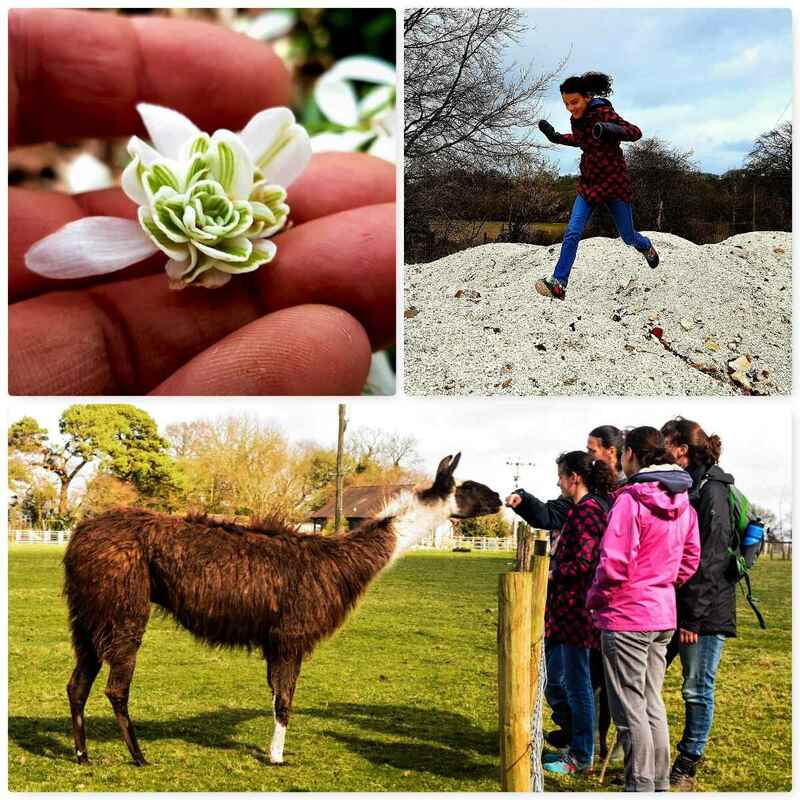 The snowdrops were still in full bloom and we investigated the colourful world that is their underside, had a stomp around a flint/chalk pile and petted the odd Llama and Alpaca. Eventually we wound our way through the footpaths and country lanes to one of Mollie’s outdoor training areas. 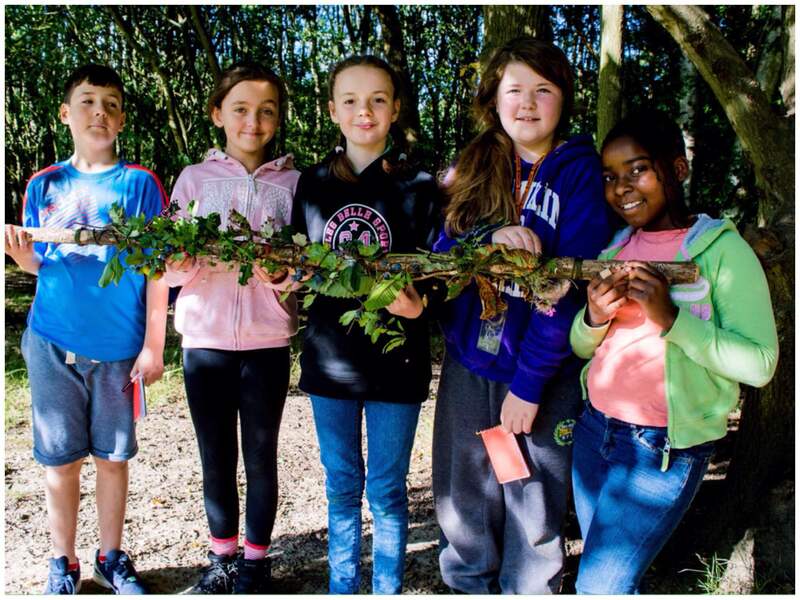 The central Beech tree was festooned with woodland art that Mollie’s classes had made, there was a small shelter and plenty of benches. 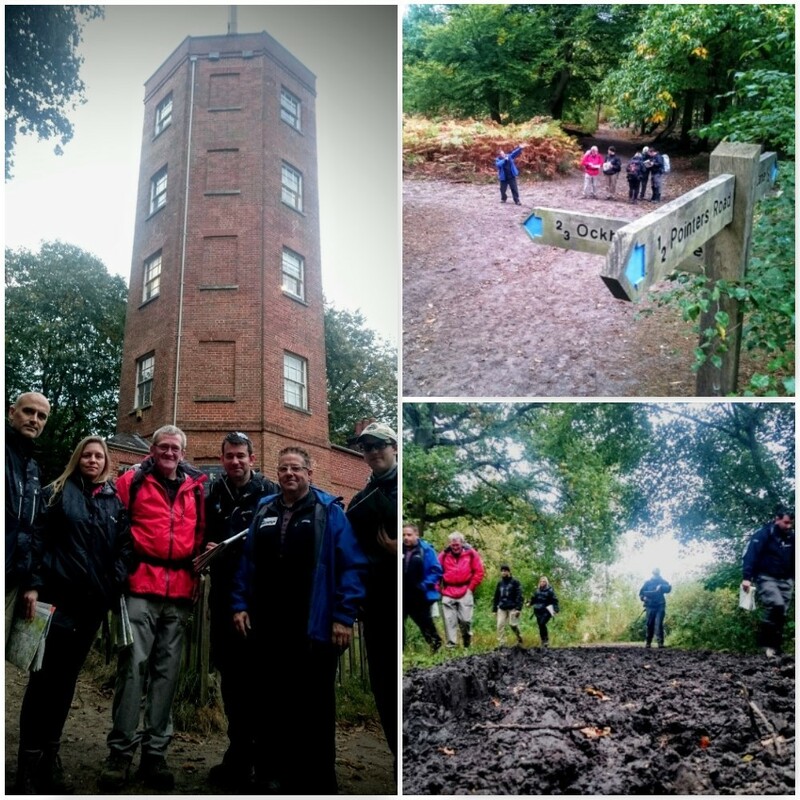 The weather changed in the latter part of the walk with some heavy showers but that did not dampen our spirits. We were soon back at the farm where I took a little time out just to photograph the animals. 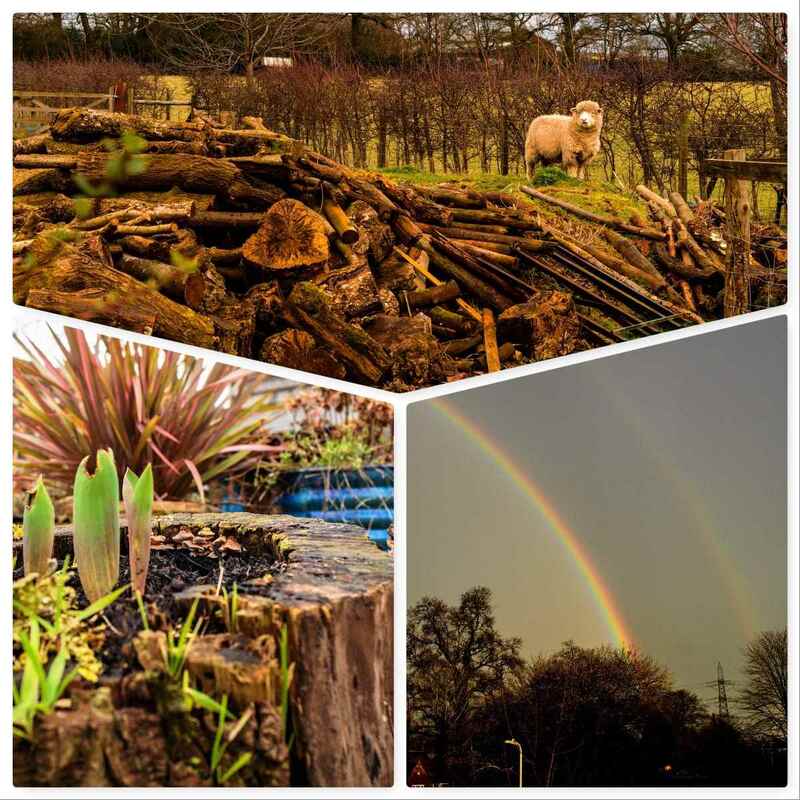 As we arrived home we were treated to a fantastic double rainbow over our house – a fitting end to a great day. 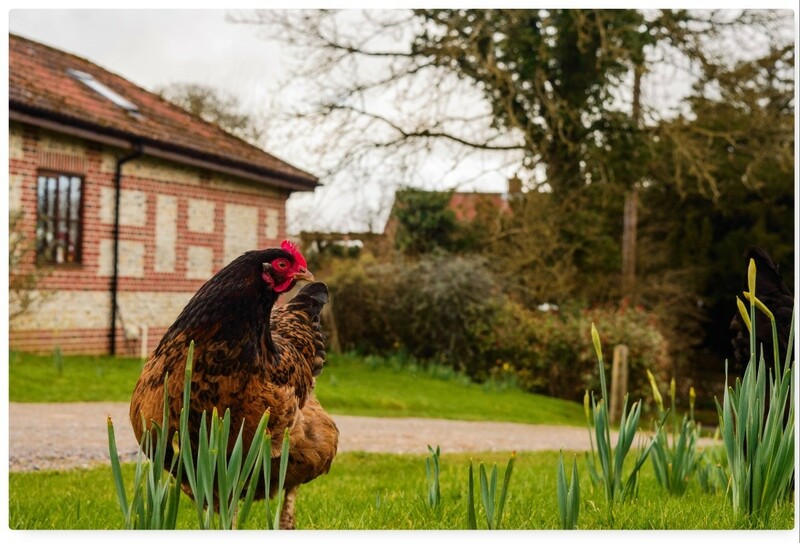 So if you are looking for somewhere to get away from the hustle and bustle of life then I thoroughly recommend spending some time with Mollie and Nick at the Field Farm Project. Where have the last few months gone? – life and work have been hectic recently so I am only now catching up on my trips from late last year. 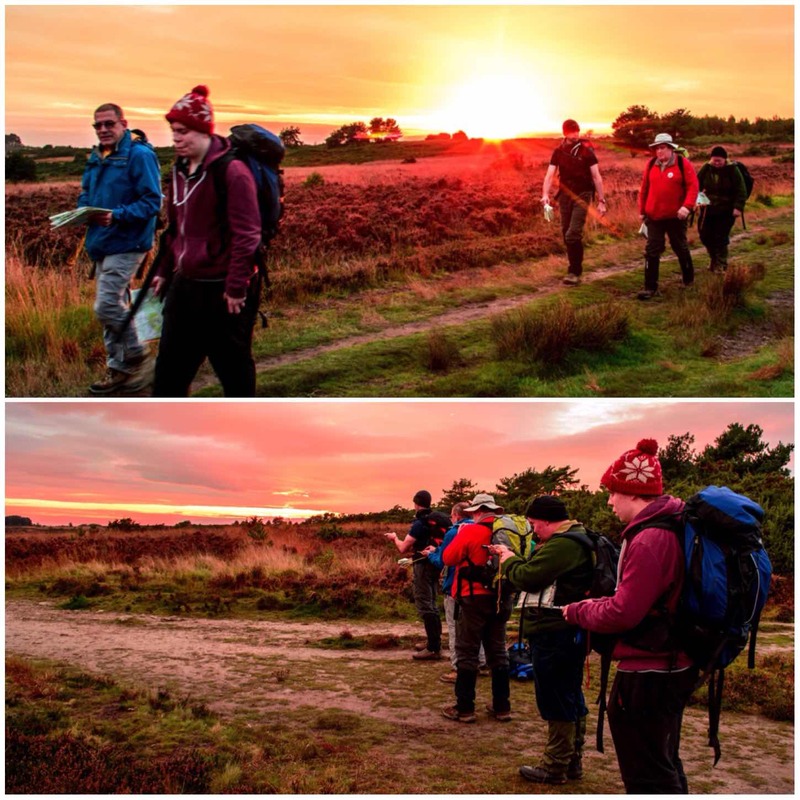 November last year found me in the Ashdown Forest here in the UK with the Sea Cadets assessing our latest group of expedition leaders. These Sea Cadet and Royal Marines Cadet instructor/students had a busy year preparing for their assessment but it was worth all the effort. 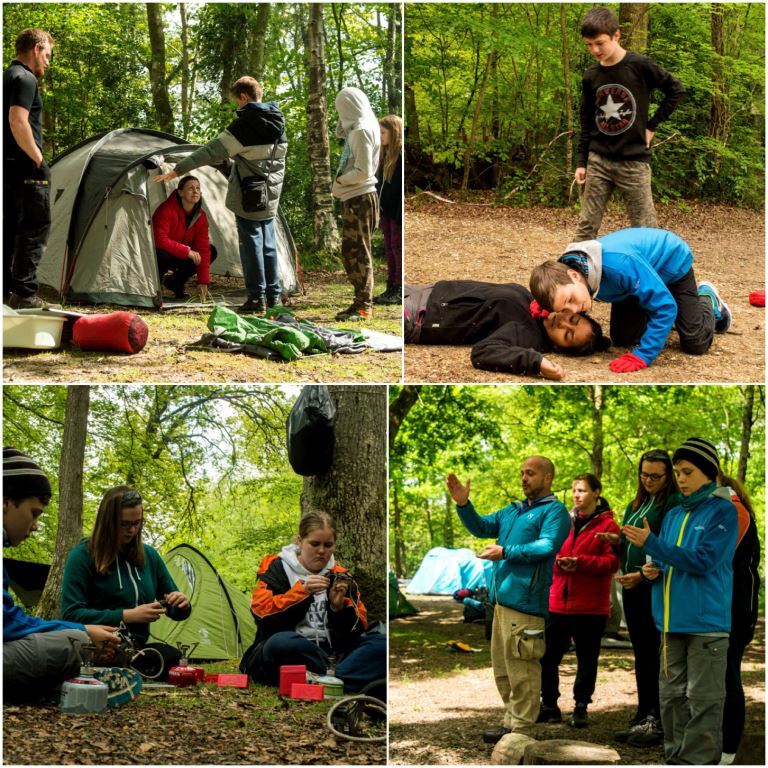 The qualification they were looking to gain was their Basic Expedition Leaders Award (Level 3). This is a nationally recognised qualification from Sports Leaders UK. 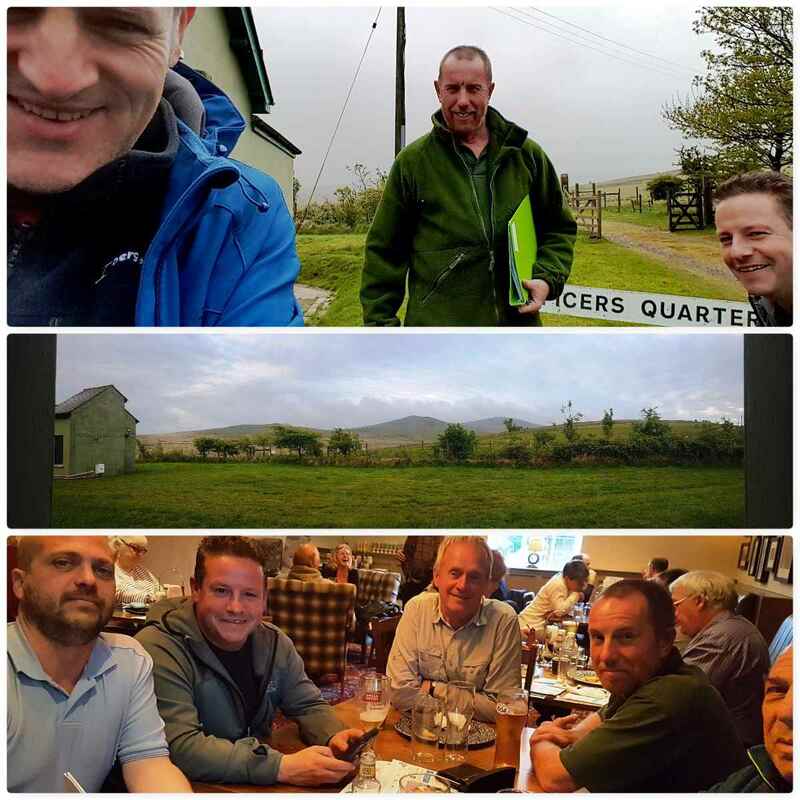 I was joined by my colleagues Perry Symes, Dave Lewis, John Kelly, Ben McDonald and Alan Lewis for the weekend. 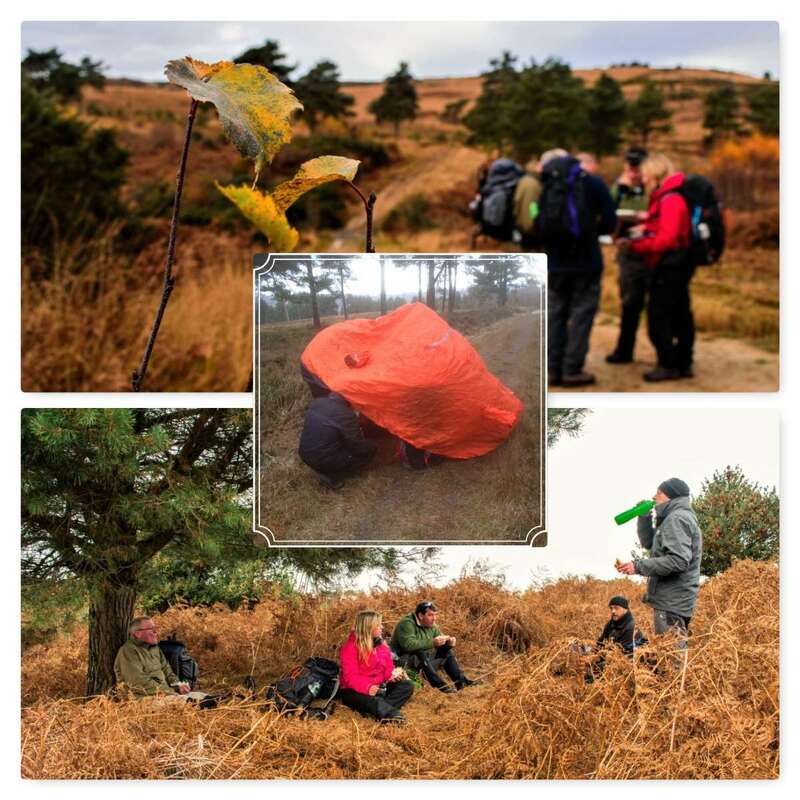 We were soon split into a couple of teams and out on the heathland and in the woodland testing their skills. Some of these students started the course with very little knowledge so it was good to see them putting all their new found skills to the test. One of the most crucial skills any expedition leader should have in my opinion is to be able navigate to a high standard. 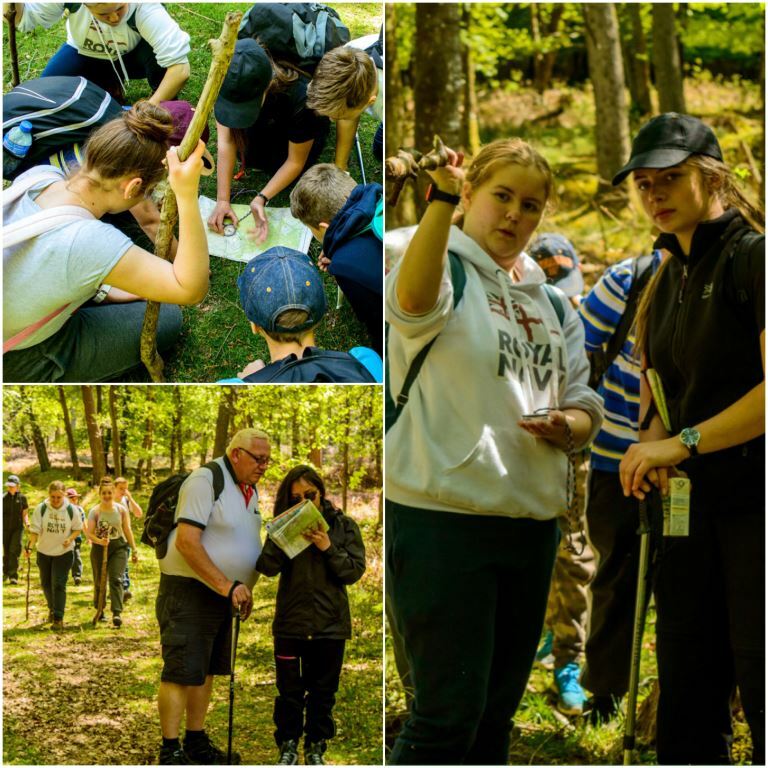 The students were not only expected to be able to use a map and compass without thinking about it but also to be able to teach the skill to others as well. Modern navigational aids are looked at on the course however it is the use of the ‘Mark 1’ eyeball, map and compass that are assessed. We spent the whole of the Saturday out and about doing this (hard work some may say). Sunday was a day mostly of testing knowledge and each of the students had to run a class. 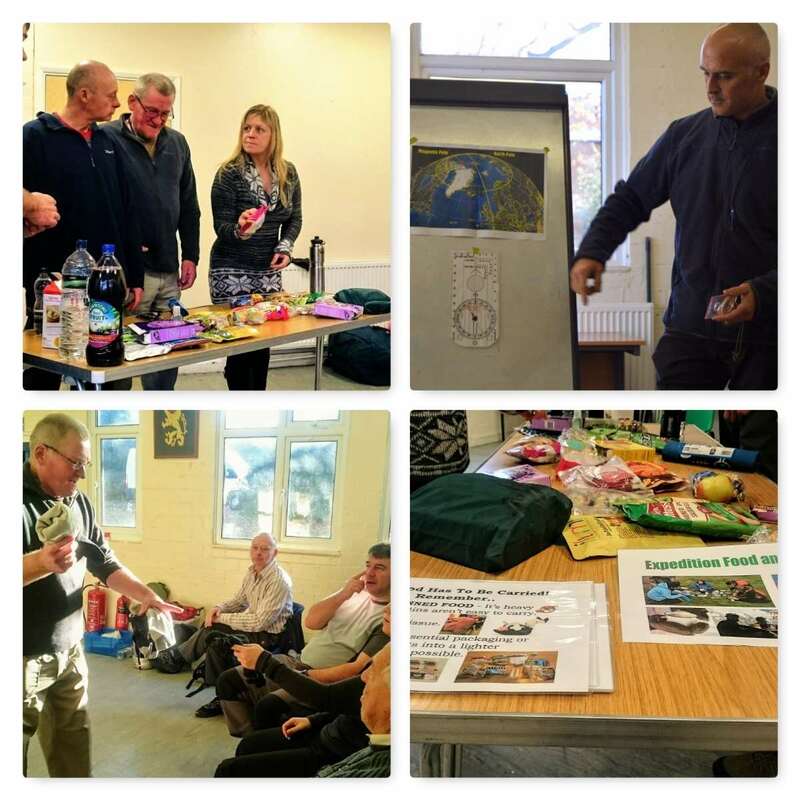 Subjects covered included expedition food, kit and the theory of navigation. One of the things I like about helping to run this course is that I keep on finding new ideas for classes from the students like using this mine tape to highlight contours. 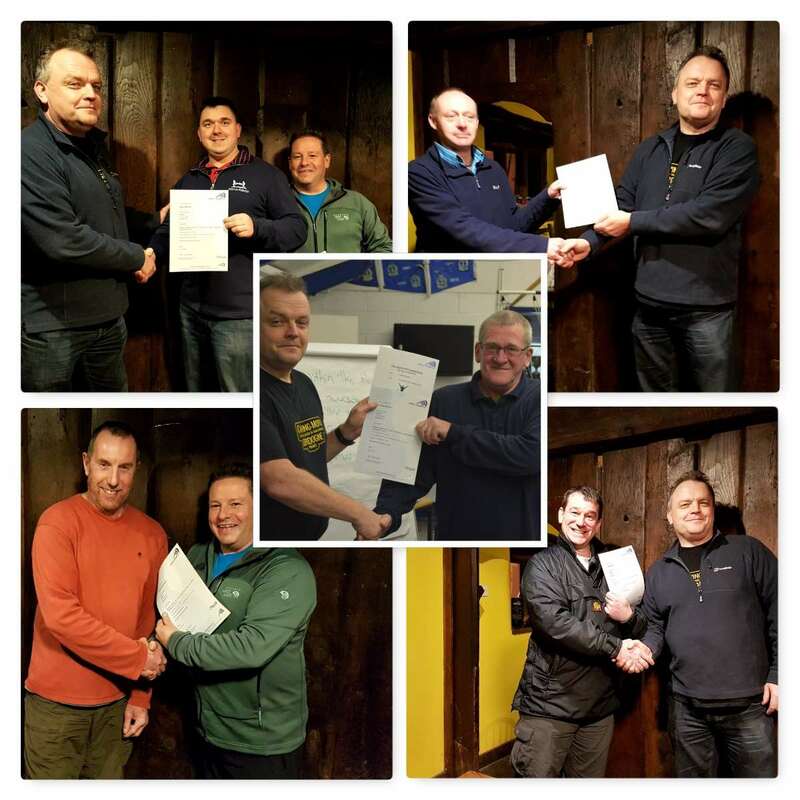 Everyone who was assessed on the weekend came up to the standards to be an expedition leader so it was great to receive the certificates and to help award them. We have been running this award in the Sea Cadets since 2010 now (I think we have missed one year) and I have worked with every group. We have a great team that is growing all the time and other Sea Cadet areas are now sending students to us or looking to emulate us. The 2017 group has already started so that one will be up on the blog sometime soon – so loads more trips planned. OK – when I say we had a ‘Boys Own Weekend’ it was not through choice – sometimes it just happens that way and no girls had booked on the course. 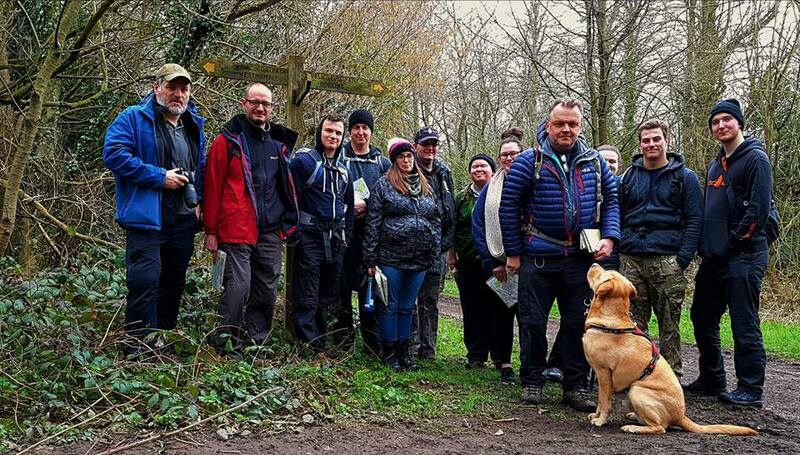 Last October I spent an excellent weekend with my friend Dave Lewis teaching some Sea Cadets more advanced navigation techniques. 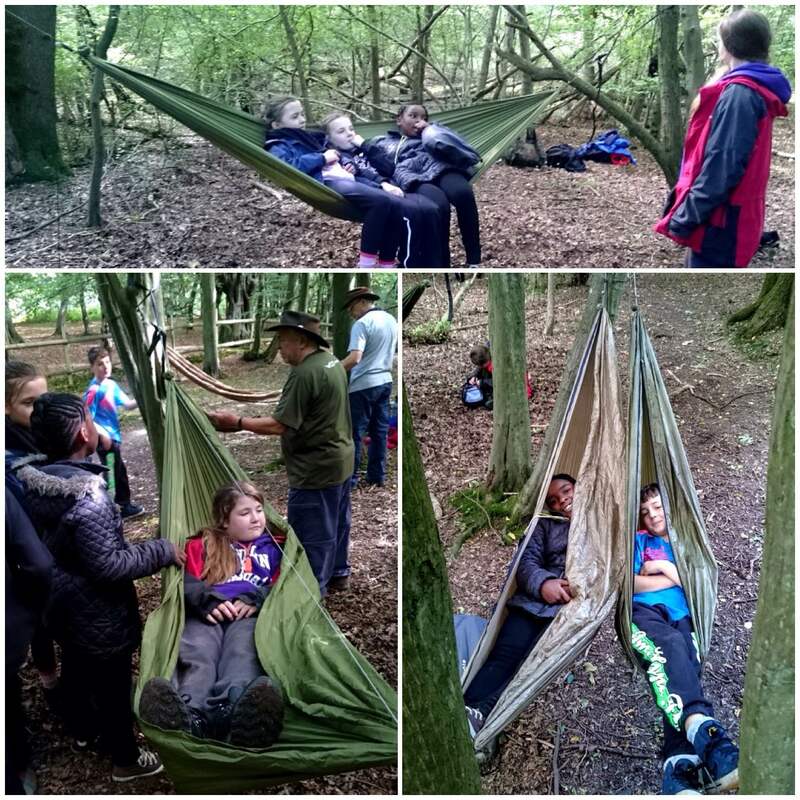 They had all completed their basic campcraft skills and so the focus was on the use of the map and compass. 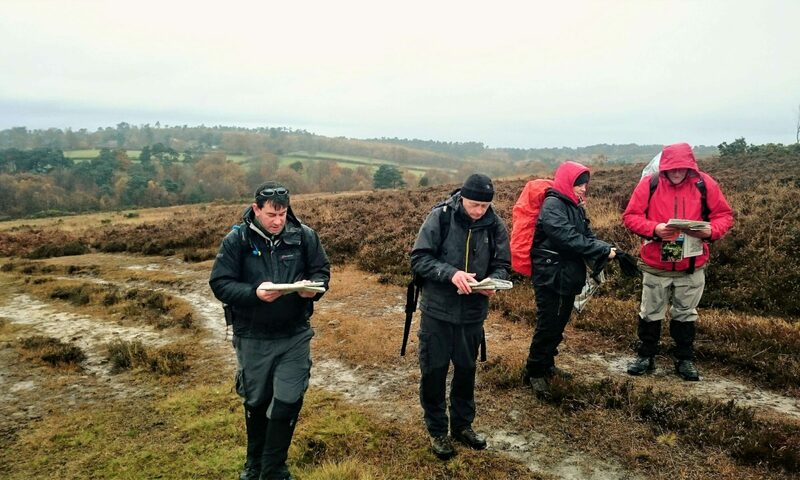 We were based in the Ashdown Forest here in the UK (Winnie the Pooh land) and really tested the lads out with their navigation. We had access to Pippingford Park training area so we were not continually bumping into people as you would do in the open access areas of the forest. 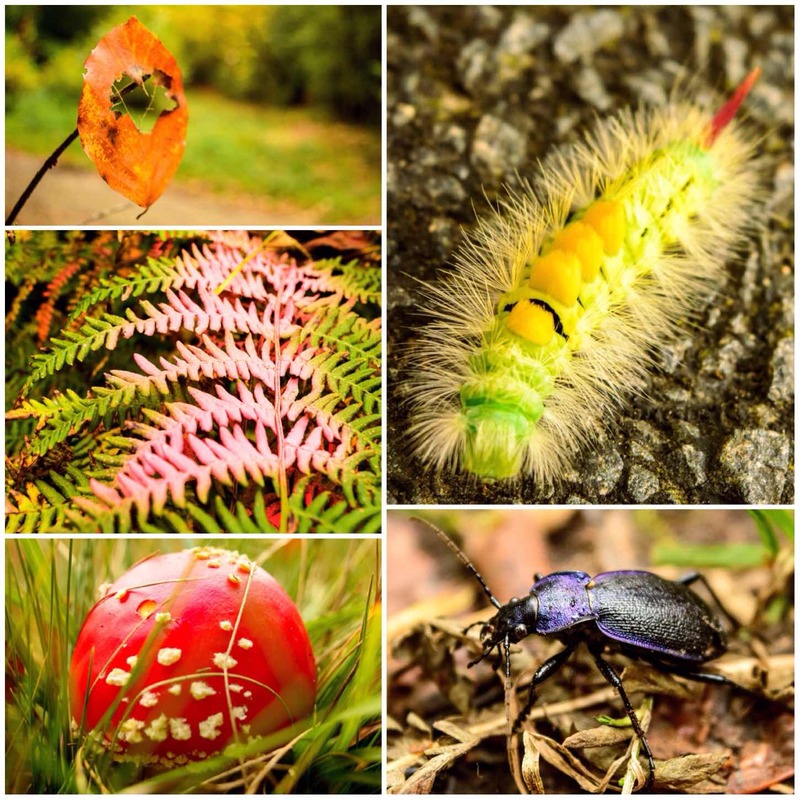 Pippingford Park has a wide variety of habitats from heathland, woodland and wetlands. The park also has many deer and wild horses roaming its interior making it a special place to visit. 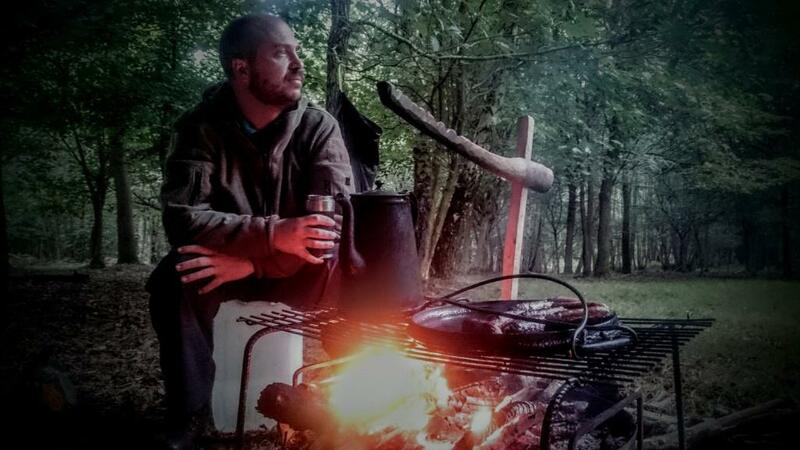 We camped in the park on the Saturday evening and soon had a good fire going. 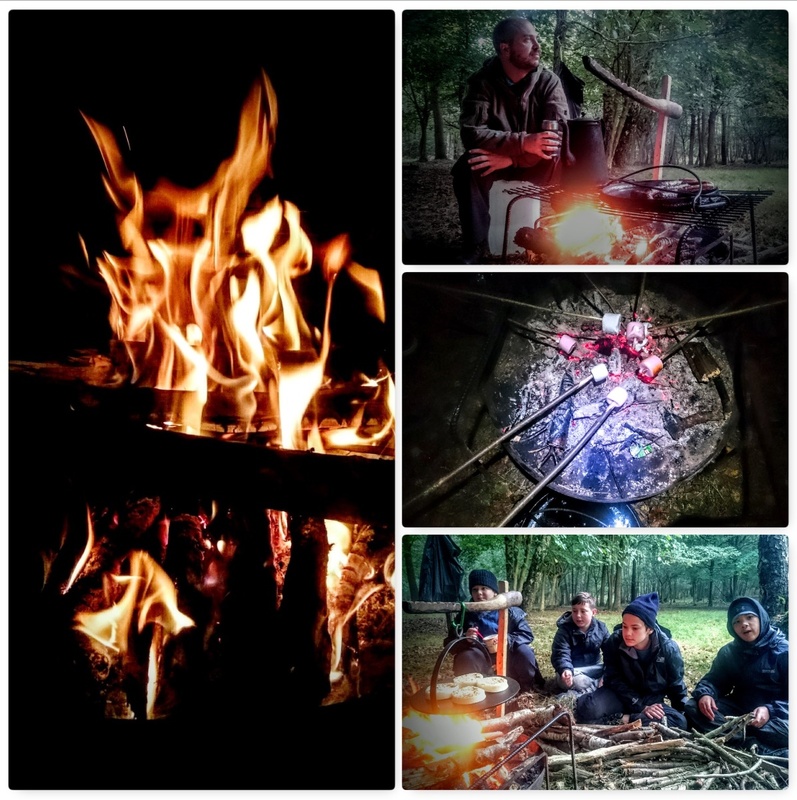 Even though it rained a lot we got the marshmallows out and I started to spot loads of fire faces in the flames. 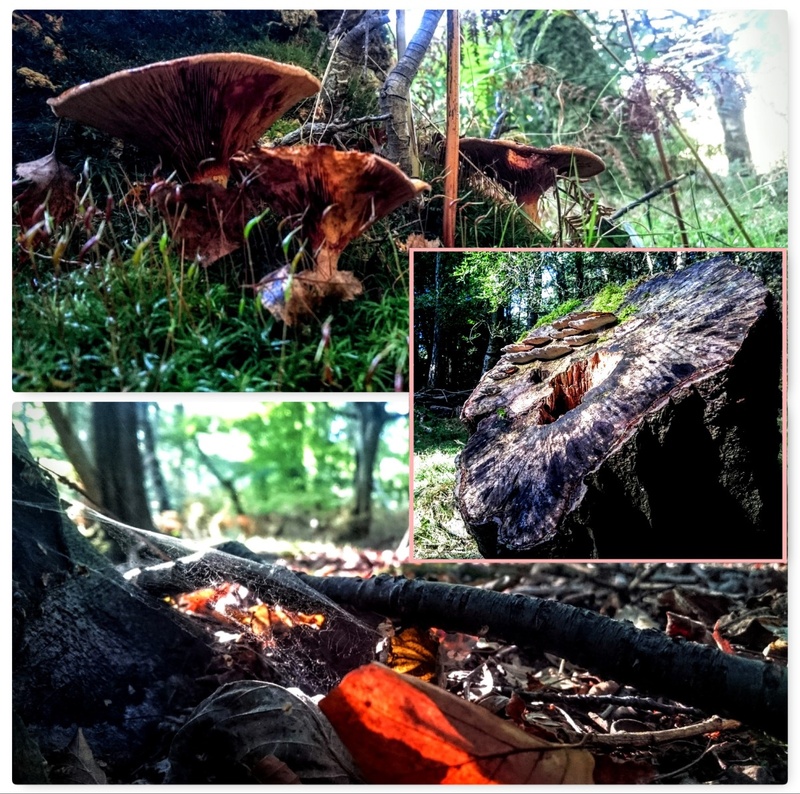 The colours were quite beautiful that weekend with all the fungi out and the leaves on the ground. Every time the sun came out so did my camera as that is when the colours came alive. 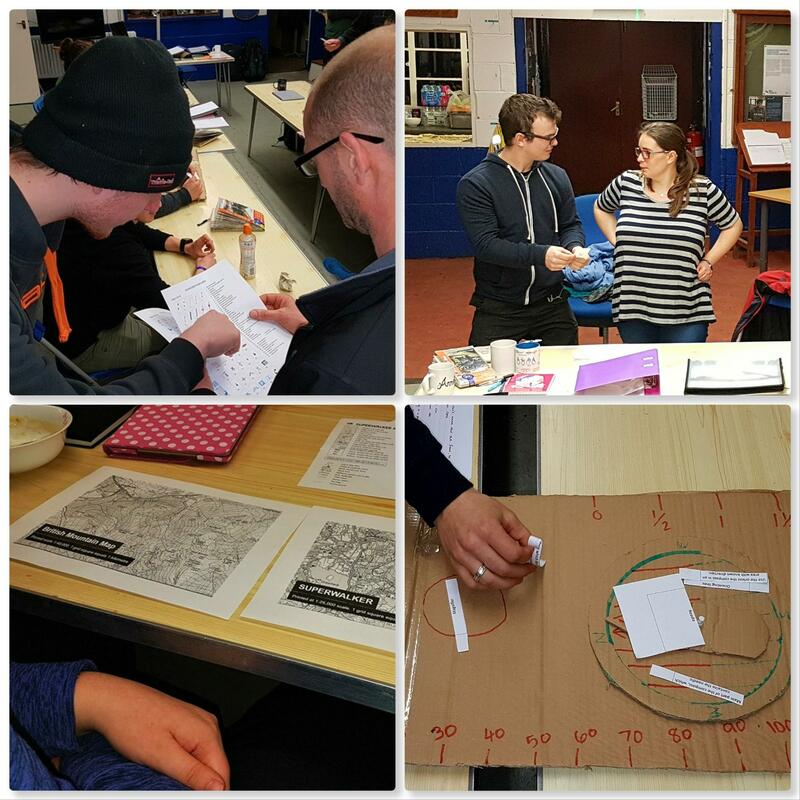 This year has once again proved to be a busy one for me on the Adventure Training front, however it has probably not been as busy as it has been for some of our ‘soon to be Basic Expedition Leaders‘ (BEL) in the Sea Cadet Corps. This weekend my friend Perry Symes and I ran the penultimate weekend in this years BEL course. 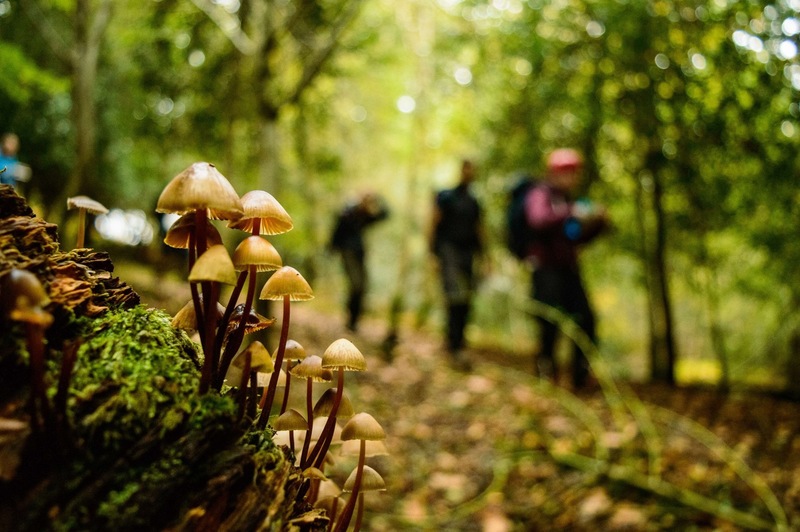 The BEL award is a nationally recognised qualification designed to give adult instructors a good grounding in becoming Adventure Leaders. 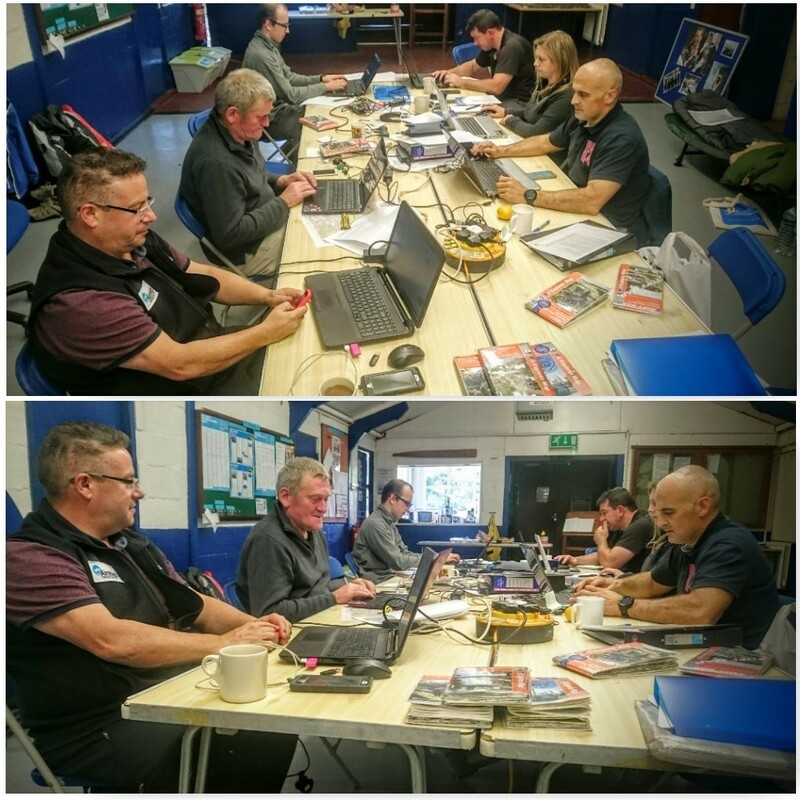 Next month they all go for assessment so this weekend was all about catching up on their paperwork and really testing their navigational and group leadership skills. Joining us on the weekend were Sarah, Lee, Charlie Chris and James. Everyone had to lead specific legs of the route we chose for them and manage the group as we went along. 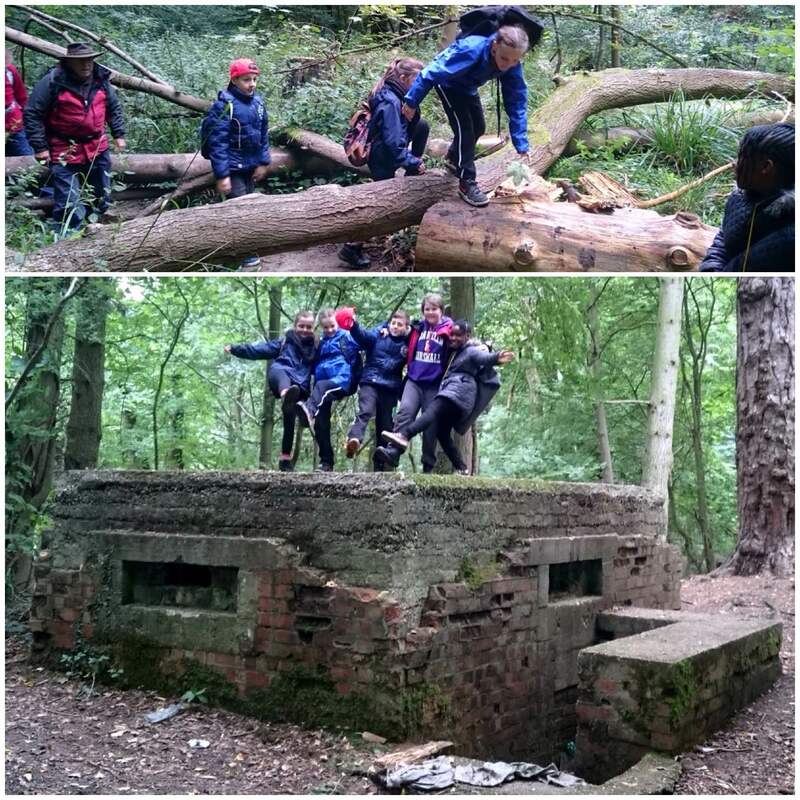 There were lots of challenges set for them in terms of giving short lessons on different subjects and making sure they could navigate to a high standard (as well as teach navigation to others). It was great to get out at this time of year and see all the autumnal colours really starting to show through. We studied hard over the weekend however we did have fun along the way. Over the weekend we stayed at the Sunbury and Walton Sea Cadet unit TS Black Swan on the banks of the river Thames. I must say thank you very much to all the staff who welcomed us, fed us and looked after us so well. I for one got to kip on my friend Paul’s canal boat (Thames Boat Training) that was moored up next to the unit – so cheers Paul :-). This enabled Perry and myself to fully focus on preparing the guys for their two day assessment next month. Adventuring is hard work – but it should also be fun. 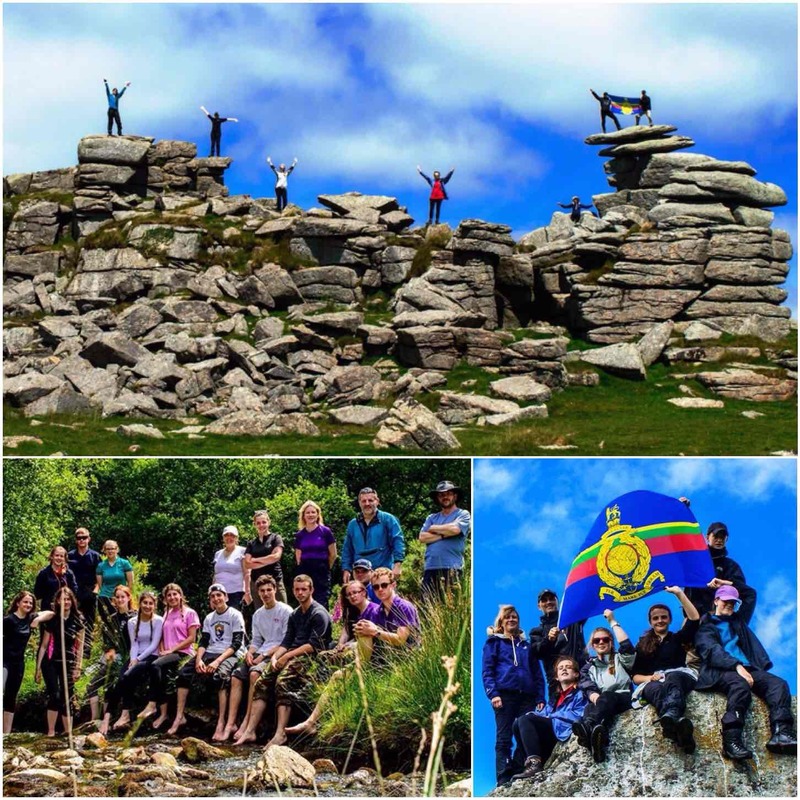 The beginning of July found me down on Dartmoor with Sea and Royal Marines Cadets and staff doing a spot of training in preparation for their assessed Duke of Edinburgh (DofE) expedition in October. 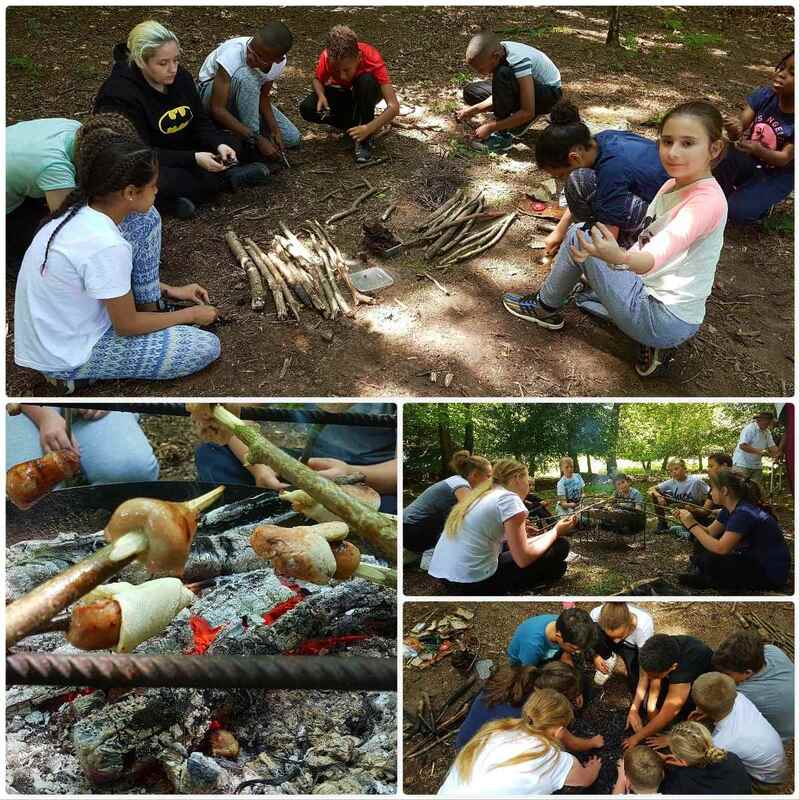 The cadets and staff were from a number of different units in the London and Southern areas. We set up camp initially at the Tavistock Camping and Caravanning site just outside of Tavistock. 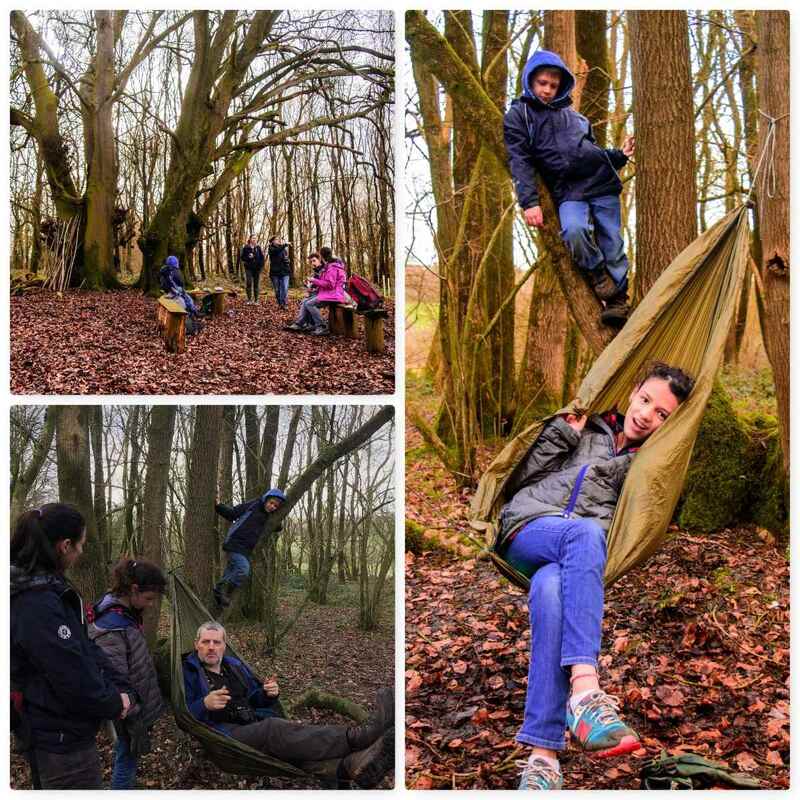 This is a well catered-for site located on the edges of the Dartmoor National Park – I even managed to set up my hammock here (always a bonus on Dartmoor, where the trees are few and far between). 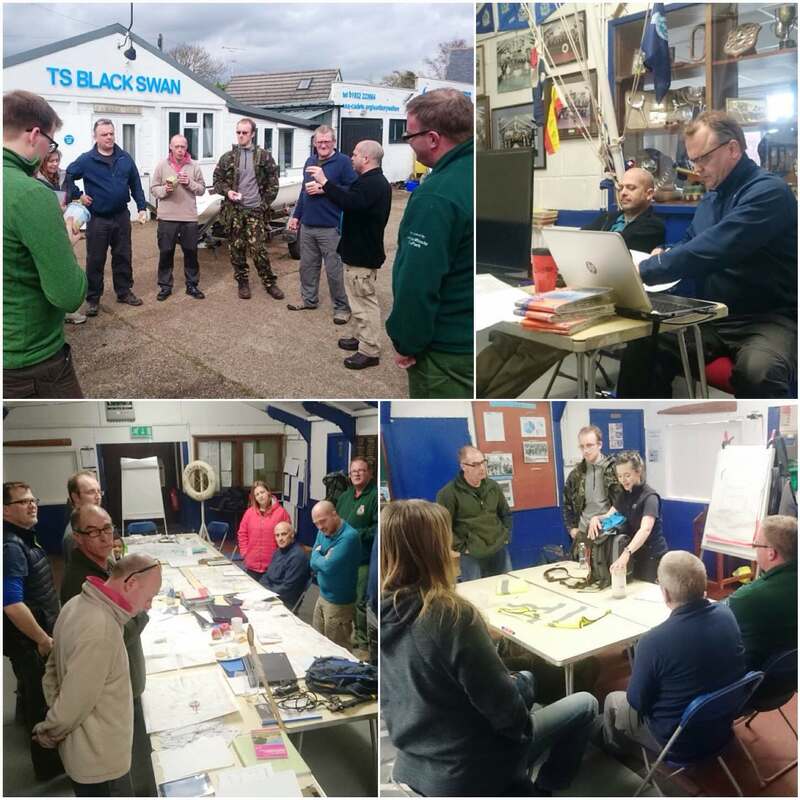 Time was spent planning and preparing for the first day out on the moor before setting off on an intensive training session the next day. Joining us were a number of trainee Basic Expedition Leaders (BEL) so there was plenty of adult cover. 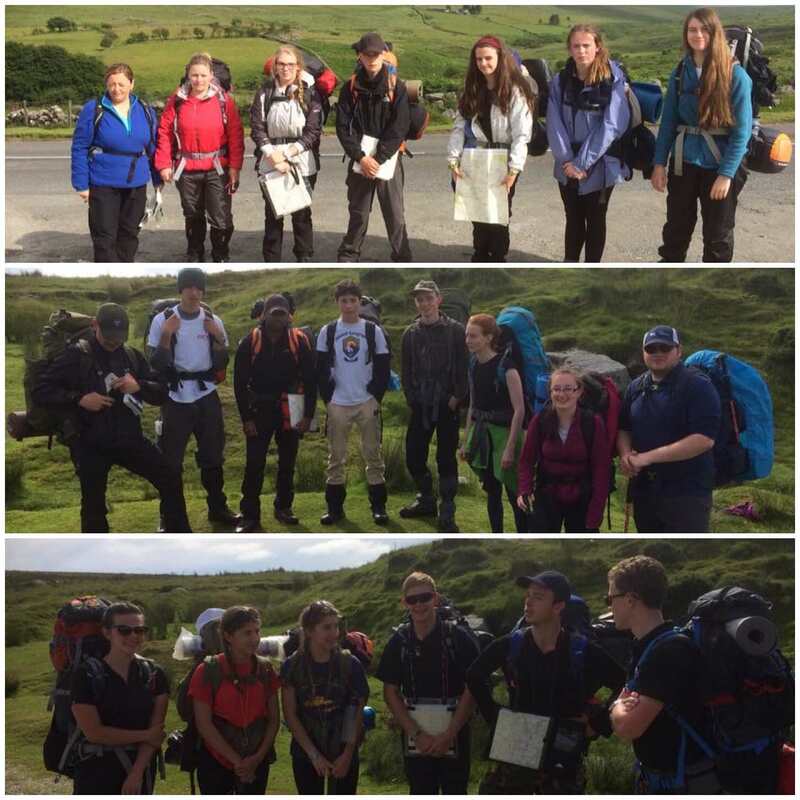 We had three teams on this expedition, two undertaking their Gold award and one their Silver. At least one fully qualified and one trainee BEL instructor were assigned to each team on this first day. 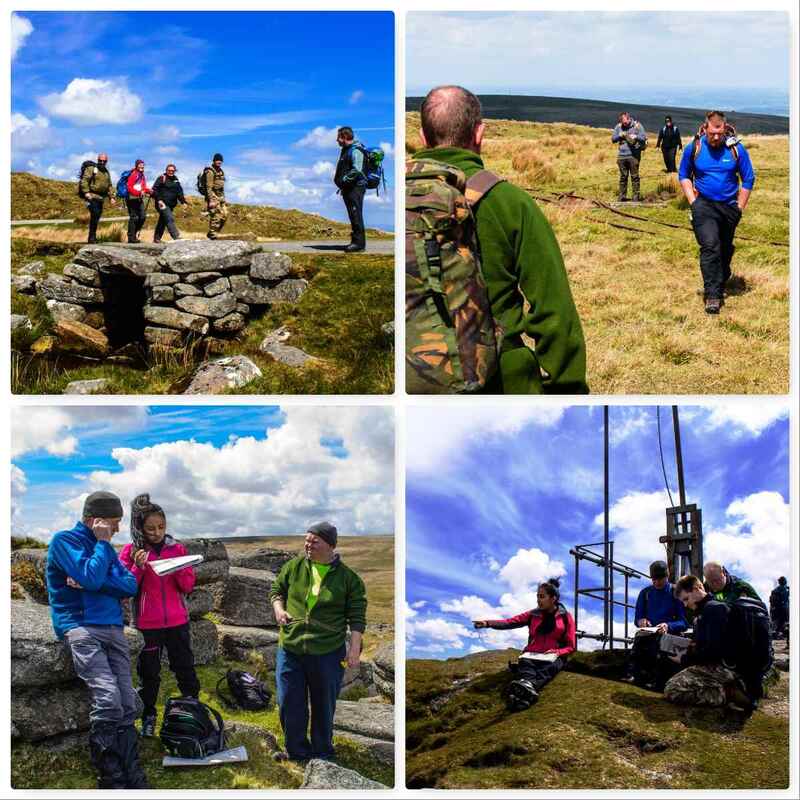 The teams spent the day learning the art of navigation and group management around the heights of Cox Tor, Barn Hill, Great Staple Tor and Great Mis Tor to the East of Tavistock. I spent my time wandering the moor keeping an eye on the different teams and meeting up with them from time to time. 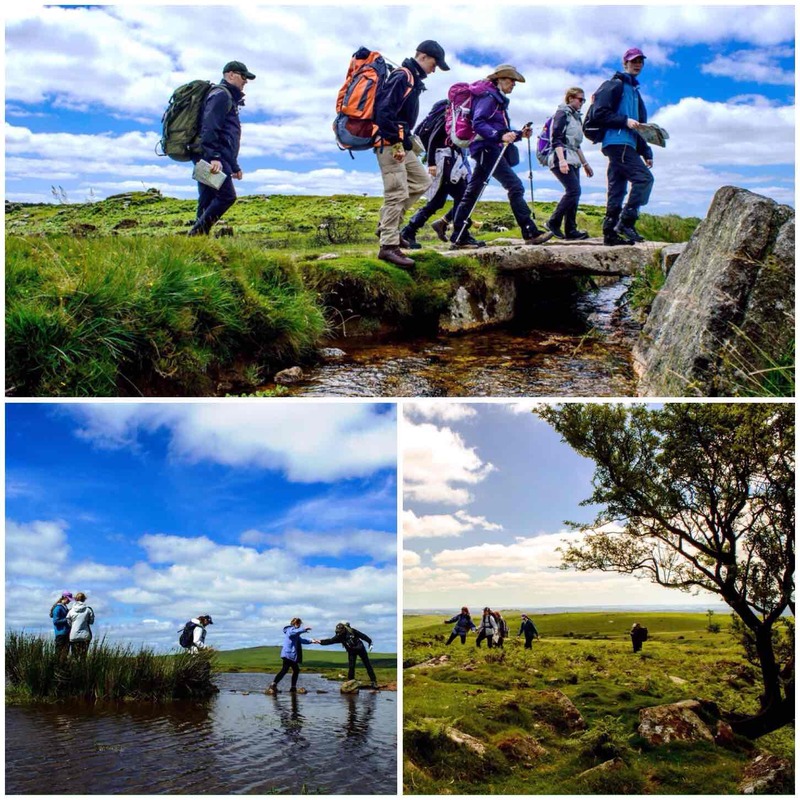 Even though the cadets and staff were only on their training expedition they were expected to navigate the moor without having a trained instructor present. 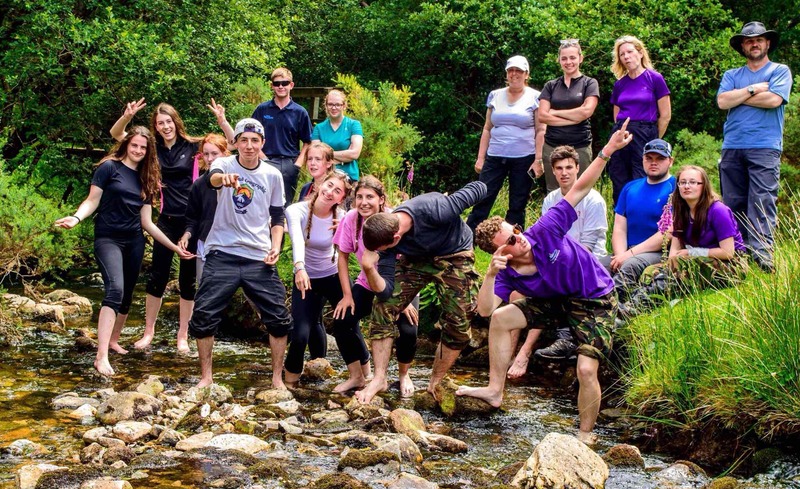 At this stage in their development our job as DofE Leaders and trainers is to step back and keep a close eye on them through ‘Remote Supervision’ – which basically means to keep a good eye on them from afar and meet them from time to time at pre-arranged check points. Below you can see the three teams with some of the instructors who were keeping a close eye on them. The bottom two teams were training for Gold and the top team for Silver. They had full packs for the next few nights and were soon off and away. The observers keeping an eye on them were Lee, Dave, Jess, Carol and Donna. While the teams were on the Moor with their observing staff I helped de-camp and move the staff tents to a new campsite in Princetown. We camped at the site behind the Plume of Feathers pub (thankfully again there was a spot to set up my hammock. We met the teams as they came through Princetown and they all seemed in good spirits. It was a hot day and we made sure there was plenty of water available at checkpoints. 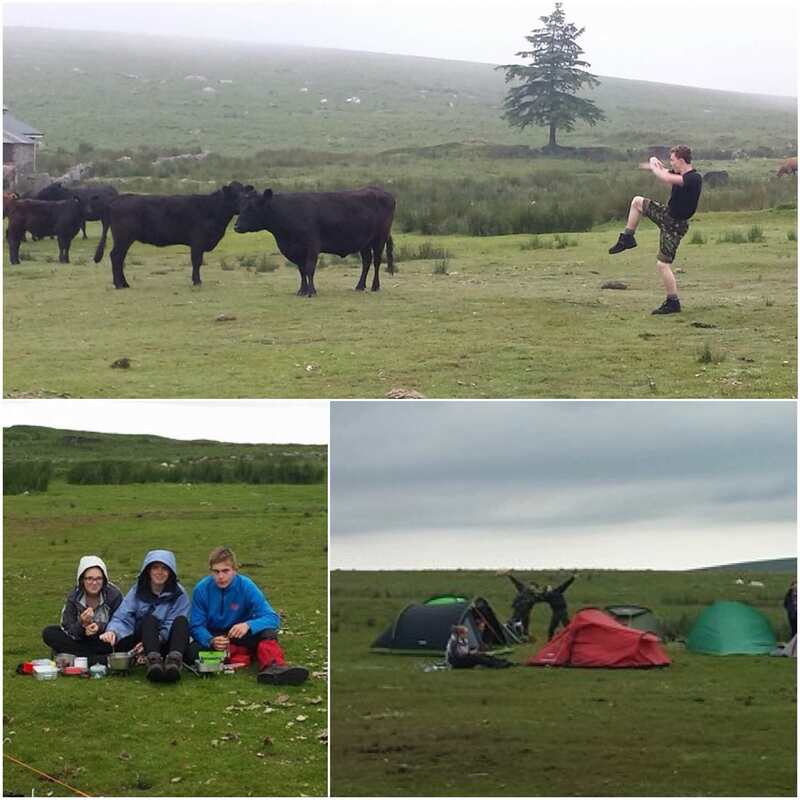 Their final campsite was in amongst a herd of cows – I think it was quite a new experience for some of them. 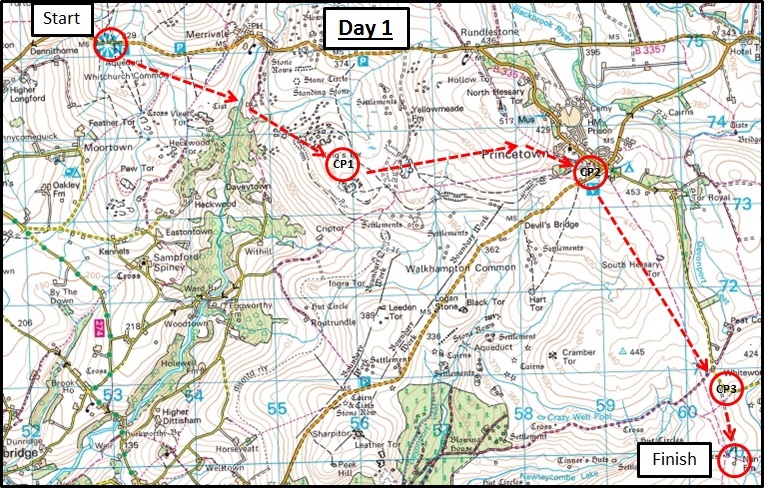 The Day 2 route was from Nun’s Cross Farm to West Stoke Farm campsite (via Naker’s Hill and Holne Ridge). The teams and observational staff (Alan, Carol, Lee, Dave and Jess) were off early so I went for a wander up onto Holne Ridge with fellow instructors John, Sarah and Donna. 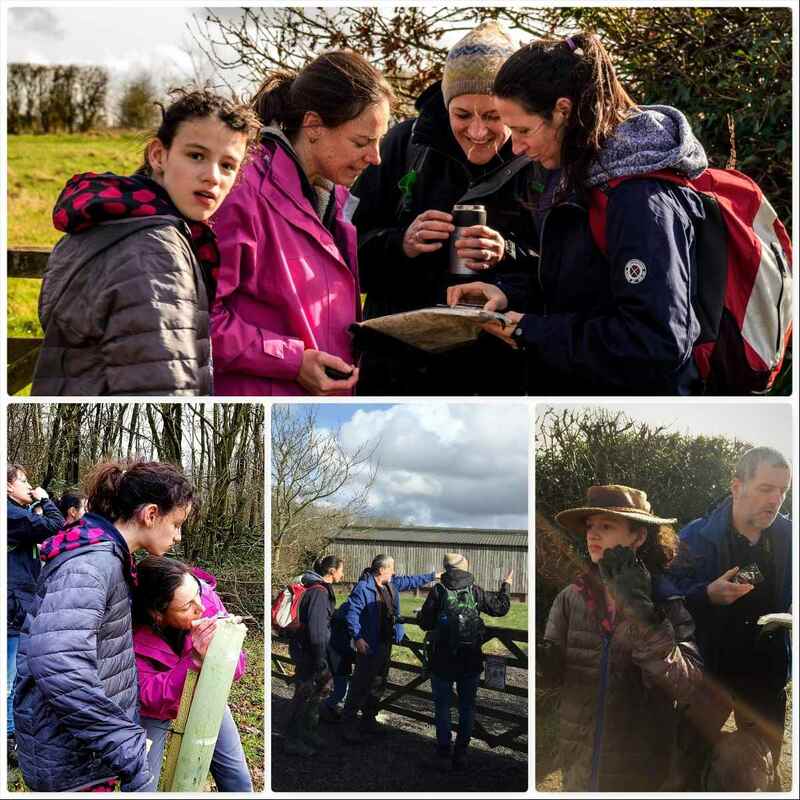 Both Sarah and Donna are hoping to become qualified BEL instructors so we spent a lot of time doing map and compass work. 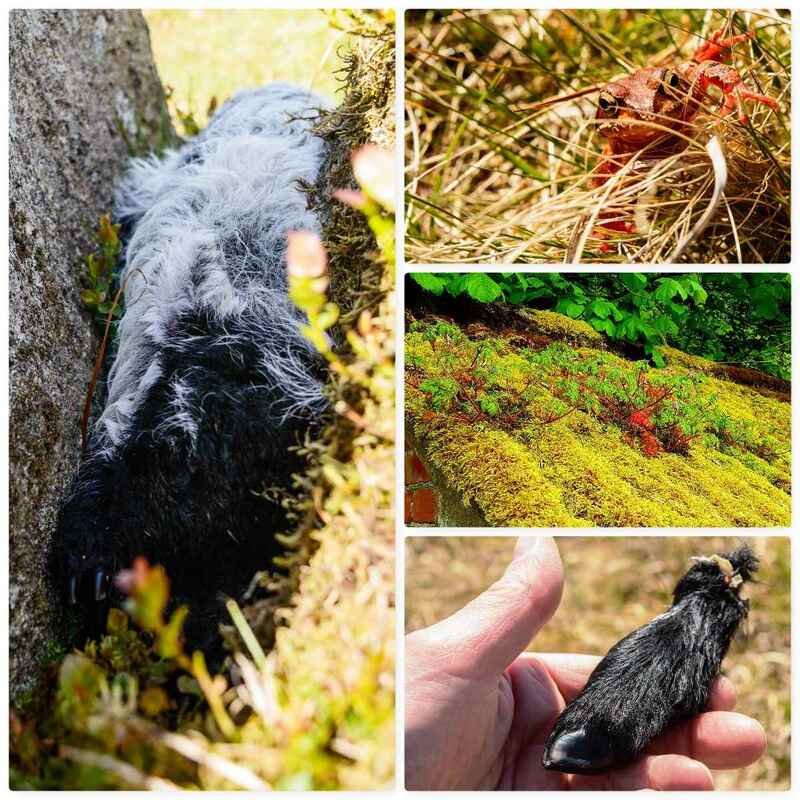 Along the way I introduced them to the delights of cleaning their hands in sphagnum moss and Donna even managed to find a whole bog full of the stuff to herself – she dried off soon enough :-). Once onto the high moors we joined up with some of the other staff and kept an eye on the teams moving across the moors. 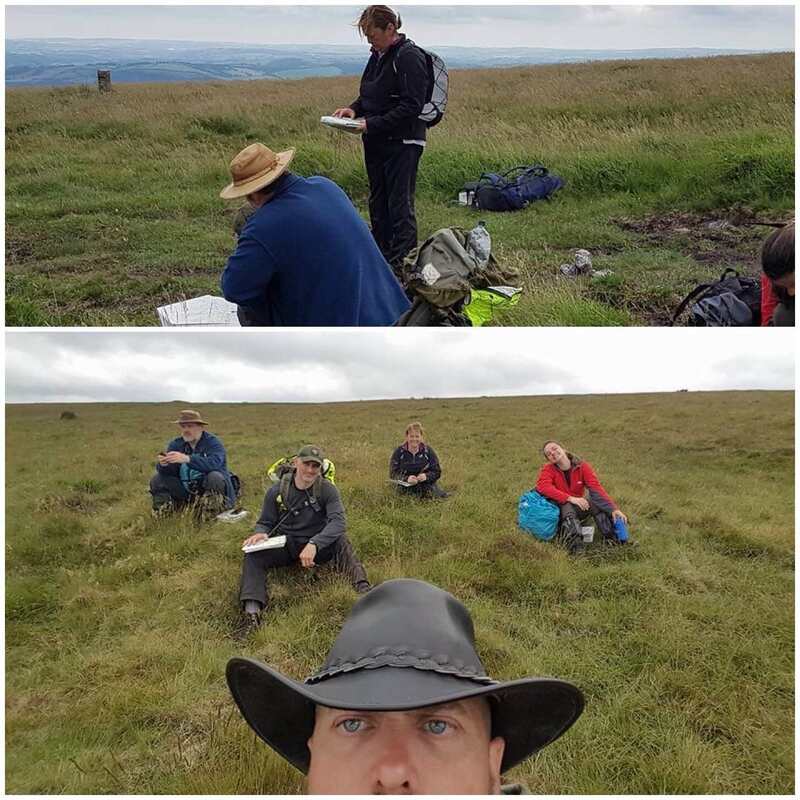 As the day was clear the trainee BEL candidates could really get to grips with their mapwork and Dave got the cracking ‘selfie’ below of us all sitting and observing at our meet up point. 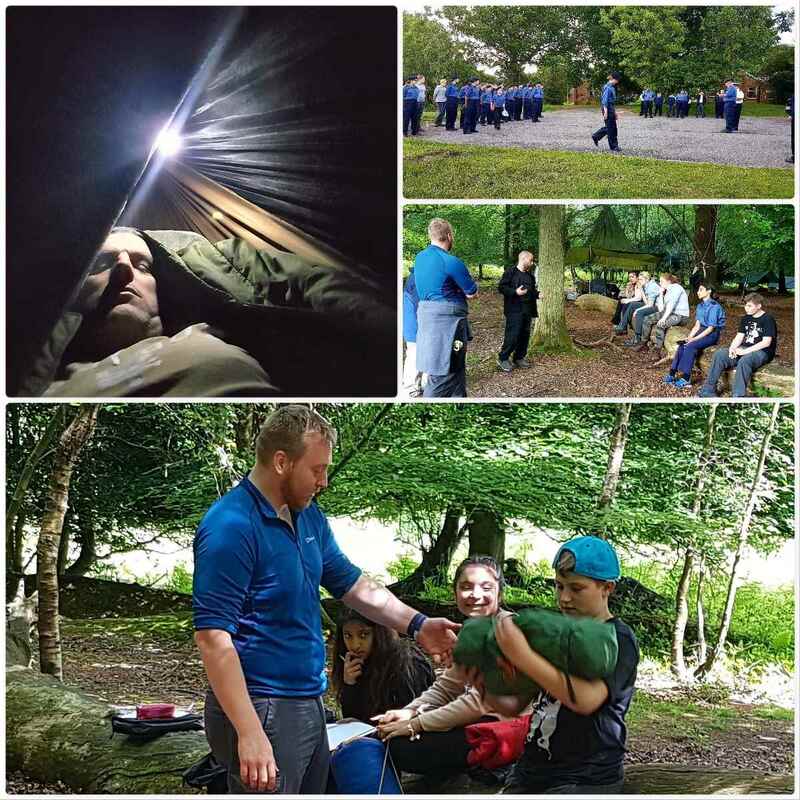 Everyone was tired at the end of day 2 (cadets and staff alike) and after preparing their routes for the next day they got their food on the go and had a well earned rest that evening. 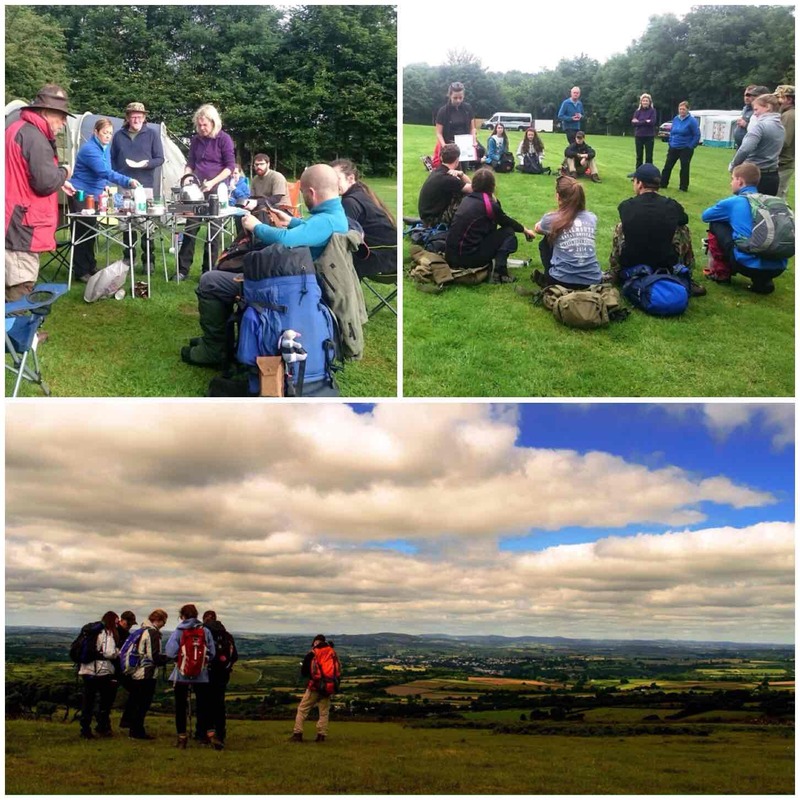 Chris made sure that the team leaders had their route planned out well so they could brief their team members. 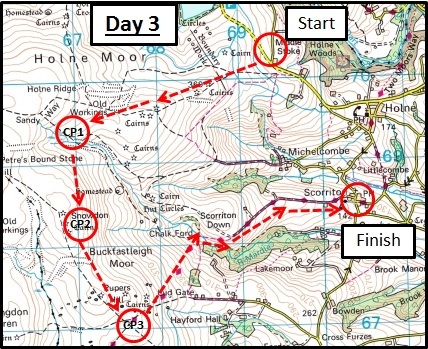 The Day 3 route was from West Stoke Farm to Scorriton (via Chalk Ford and Pupers Hill). As this was our last day and we needed to get back home everyone was up and away by 8am. I went with a number of staff to the end point at Scorriton and headed off with Jess. Carol and Donna up onto the Moor to meet the observers. The observers, Dave and Chris, had good visibility so were able to keep me informed by radio of the teams’ locations all the time. 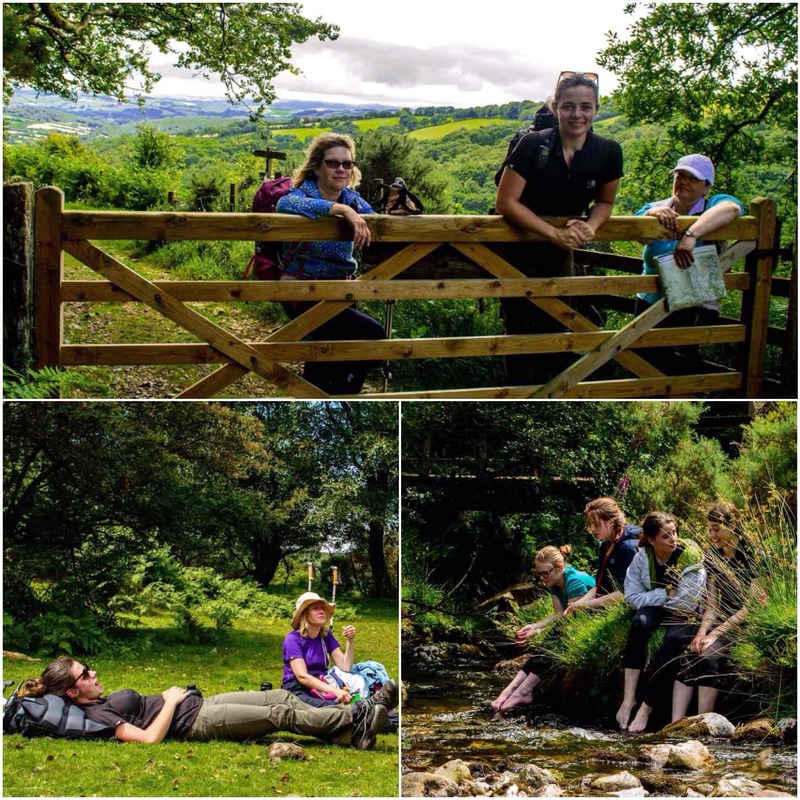 As there was no need for everyone to climb up onto the moors I left Jess, Carol and Donna by a stream crossing that the teams would have to pass and set off up Pupers Hill to meet the teams. Soon everyone was down off the moor and relaxing by the stream where I got some great shots of everyone. After a good rest we headed off but could not resist a quick climb into this magnificent tree (well, Dave and Jess couldn’t resist it). Based on the amount of moss and lichens on the tree you can begin to appreciate just how wet this area can be. This was a hard week with misty mornings and hot afternoons. 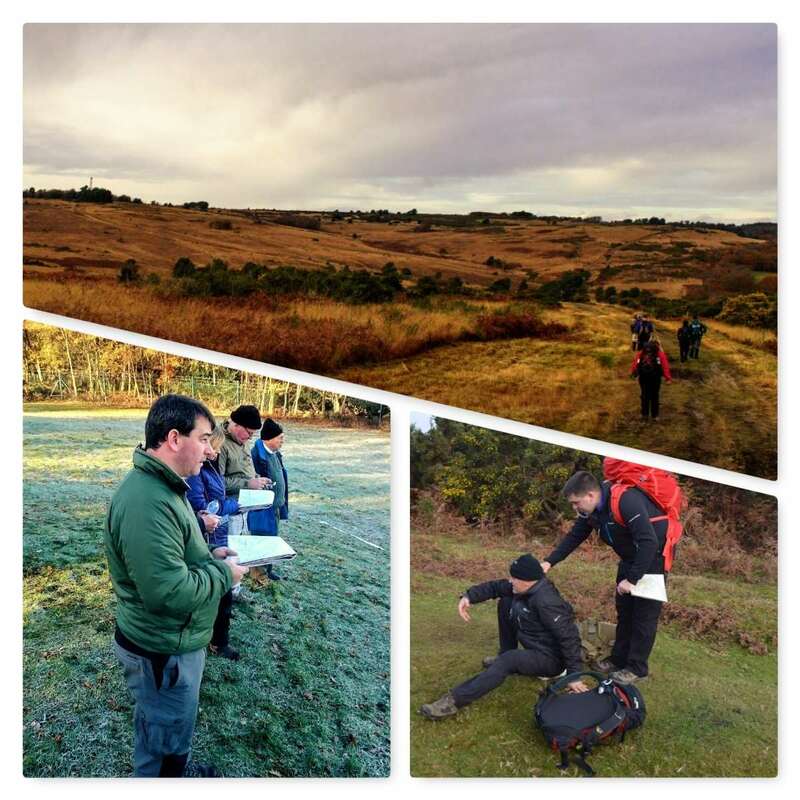 Everyone worked well and really developed themselves so that their assessment expedition in October will be a success. We did though as you can see below have some laughs along the way. 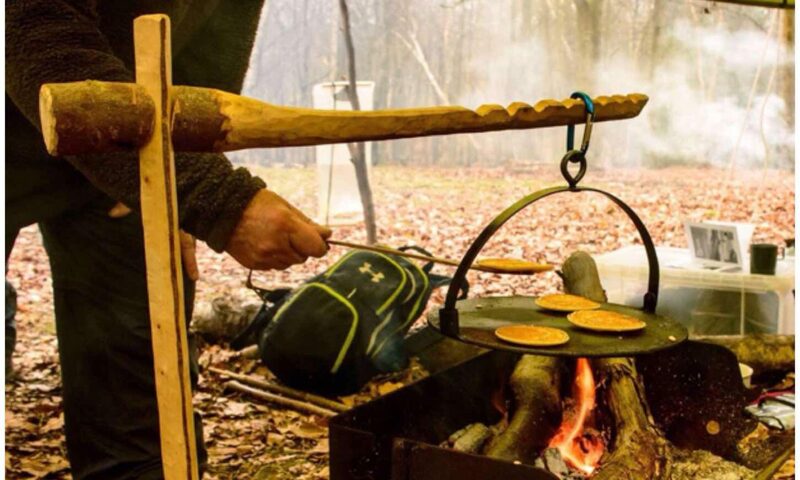 Adventuring is hard work – but it should also be fun. 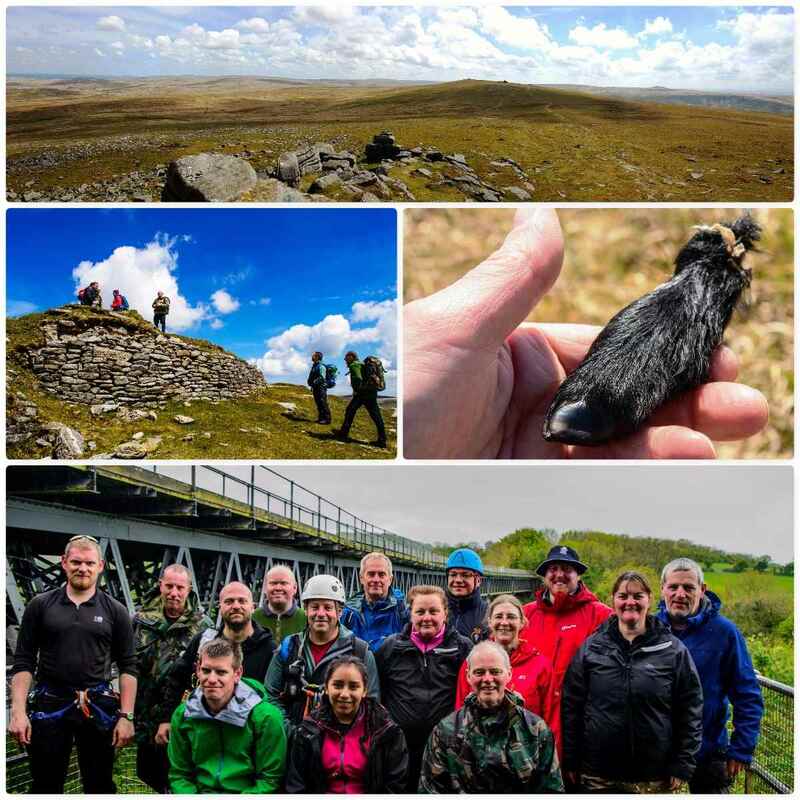 I am looking forward to working with everyone again in October when we will be running the assessed expedition on the Brecon Beacons. Recently I have been reading a lot on social media about how kids and adults seemingly do not interact enough with nature. 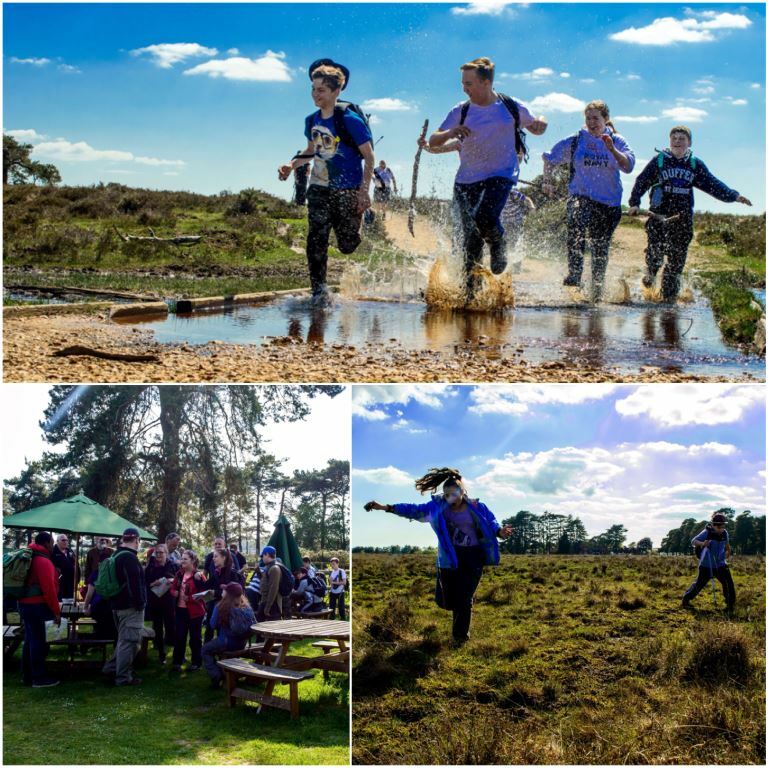 This is now the fourth year I have written about our annual trip to the New Forest so I would like to say that whoever writes these general stories has never been out with the Sea Cadets. 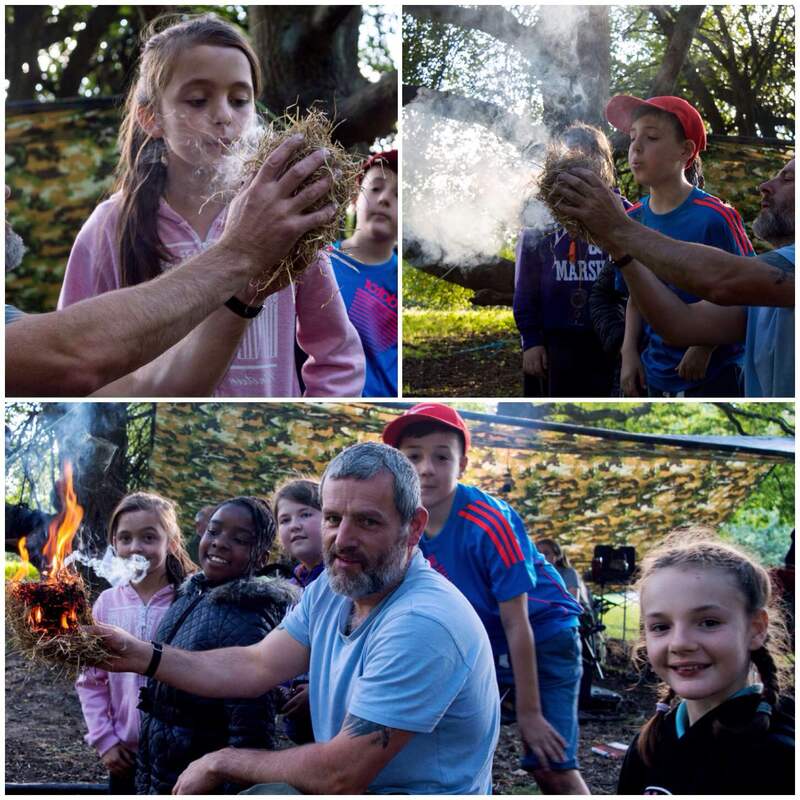 We immerse both our cadets and staff in nature, so much so that they keep coming back for more. 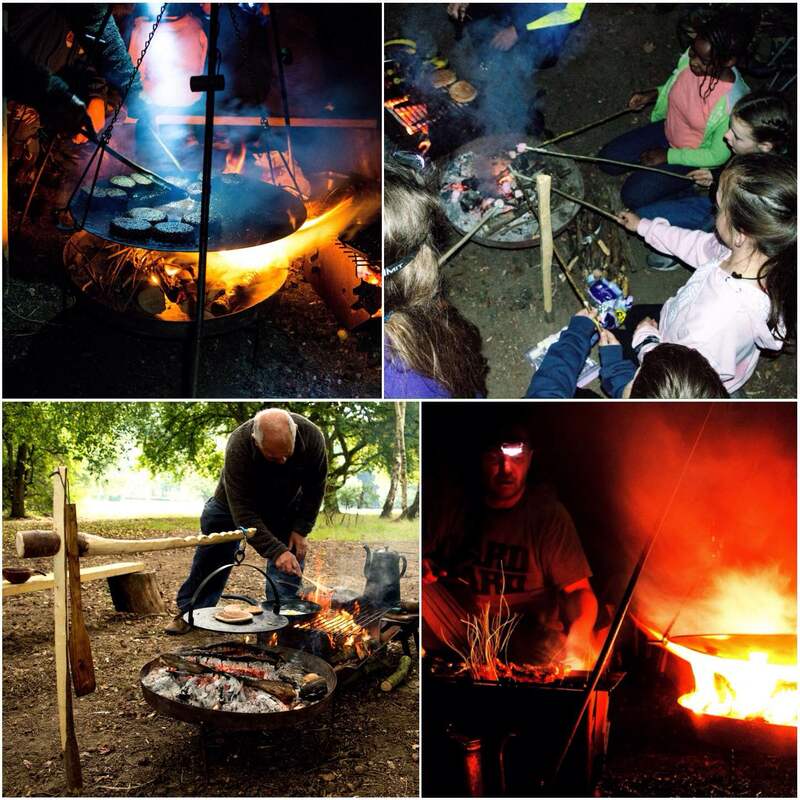 This is the story of just one of the many expeditions we run throughout the year. 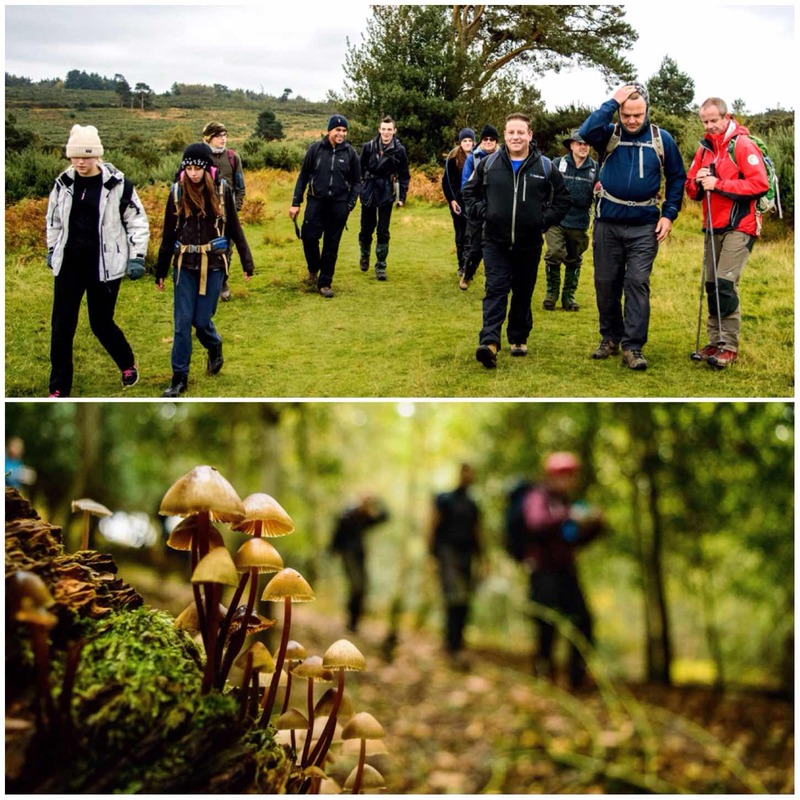 This particular expedition is arranged each year so that we can skill up our cadets and staff in Adventurous Training (AT) activities and also to support the annual HMS Hood Remembrance Service at Boldre church in the New Forest. 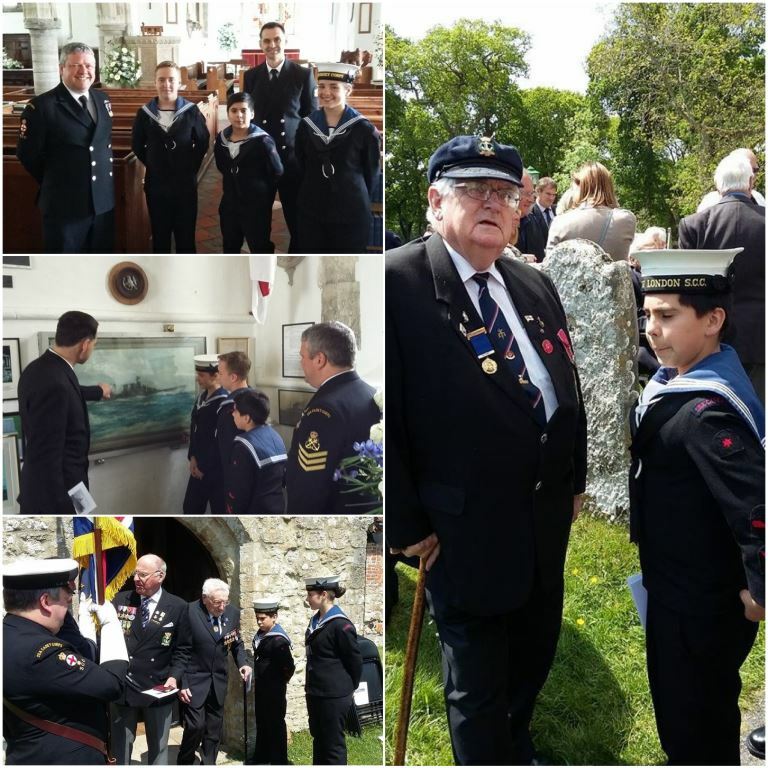 The weekend is organised by Chief Petty Officer Paul Townsend (City of London Sea Cadets) and we have cadets and staff attending both from London and Southern areas. 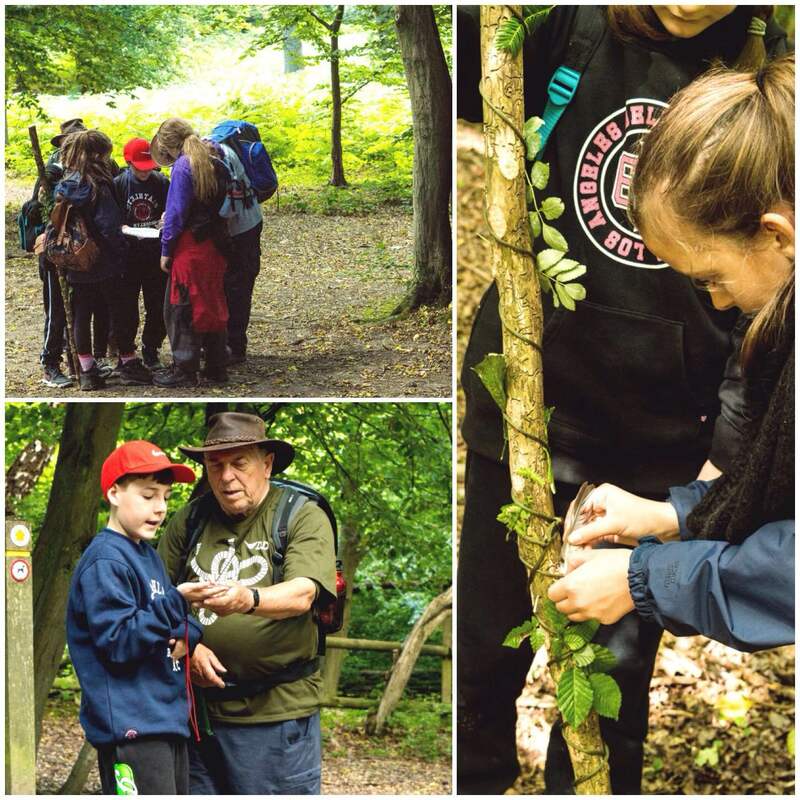 Our aim is to immerse everyone fully in nature as well as teaching them the traditional AT activities such as map reading, compass work and camping. 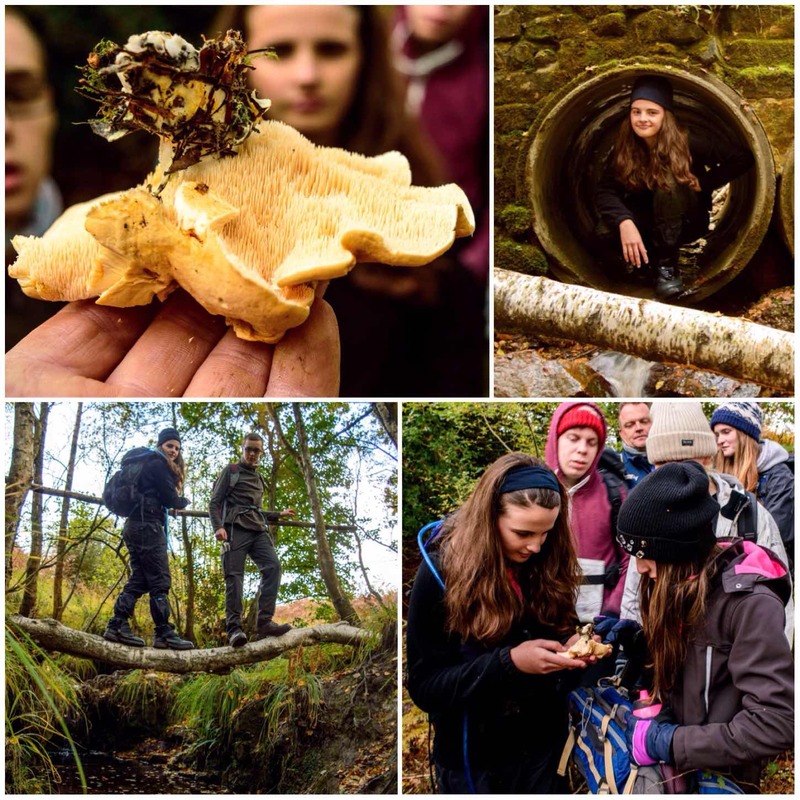 This weekend saw the cadets finding the skeleton of a fox, observing pond life and scrambling all over the woods. 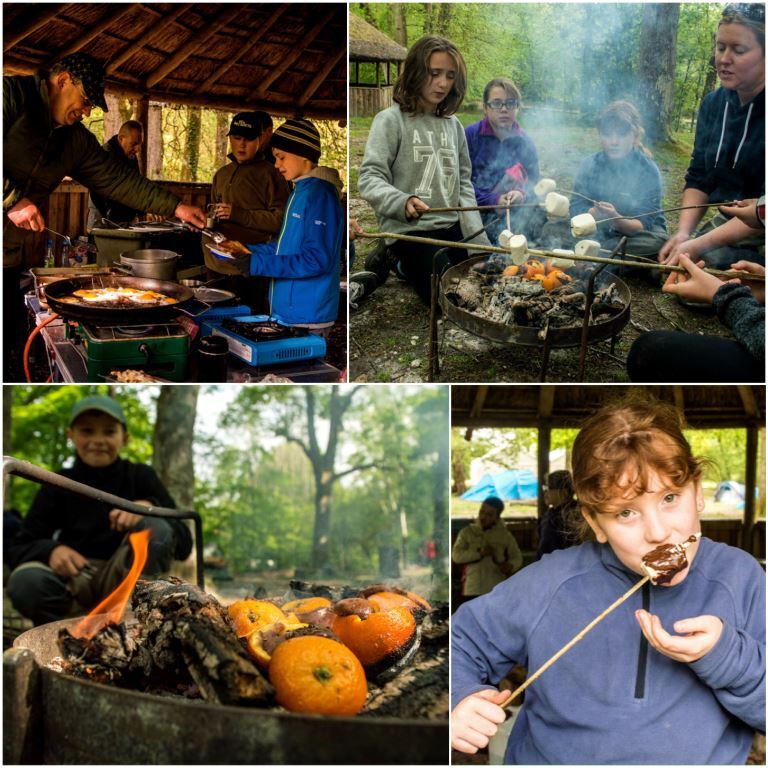 We have various groups set up over the weekend focusing on different skills. 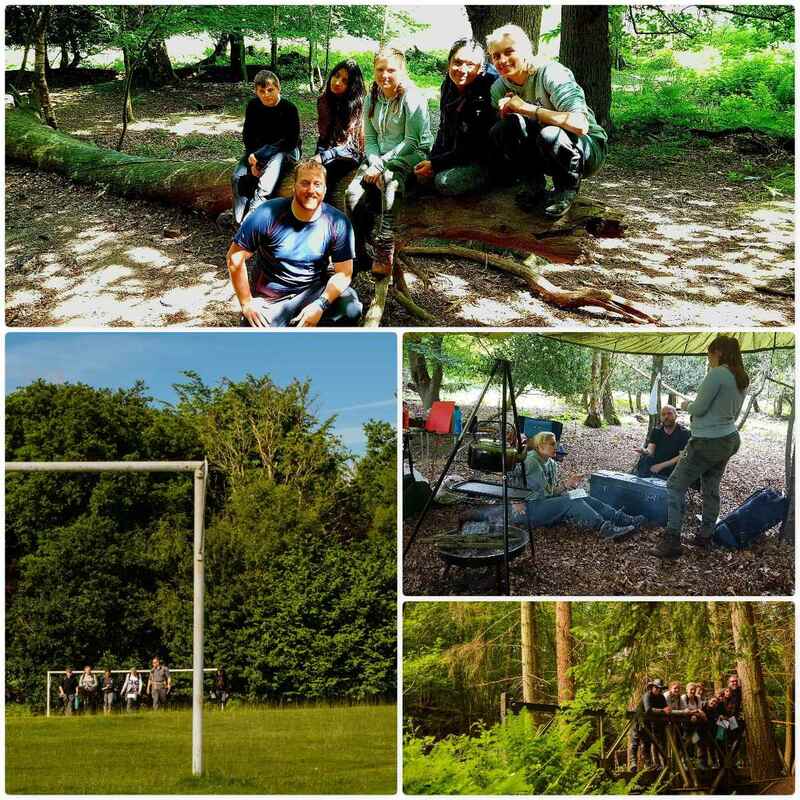 There was a group for the Juniors, various groups for the older cadets and a Duke of Edinburgh’s (DofE) group out as well. 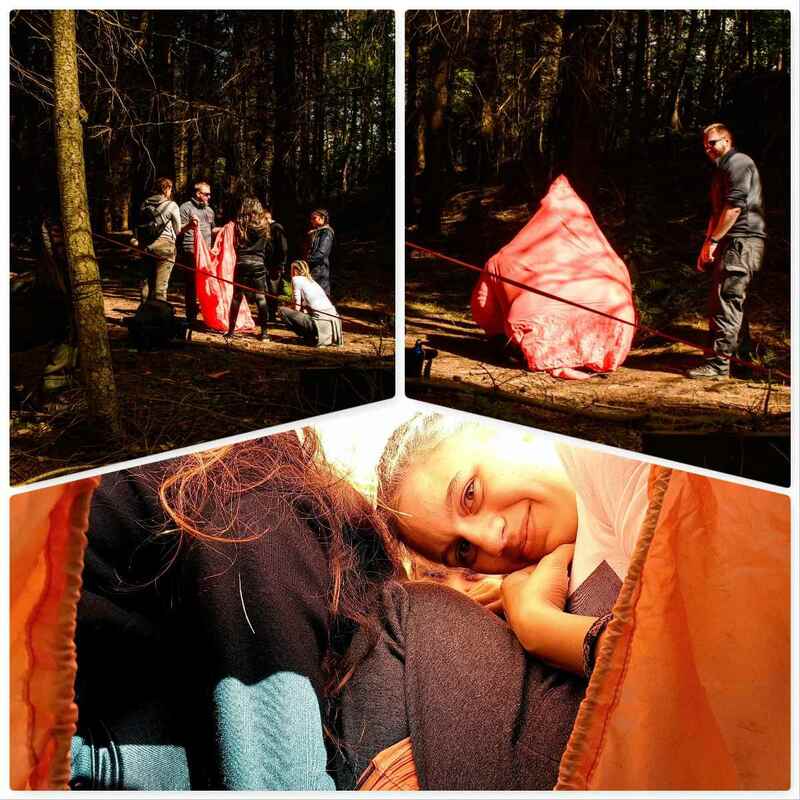 I took out a group with Paul, Jess and some of the older cadets, The cadets were looking to gain various camping tickets and Jess was under training for her Basic Expedition Leaders (BEL) award. This requires her to have a high level of navigation skill however it also requires he to have the skill to pass that knowledge onto others. Now it is not all hard work and no play by any means. Soon the cadets were flying through the puddles and we took time to rest up on the Saturday afternoon at the hotel near Beauly Rd station. 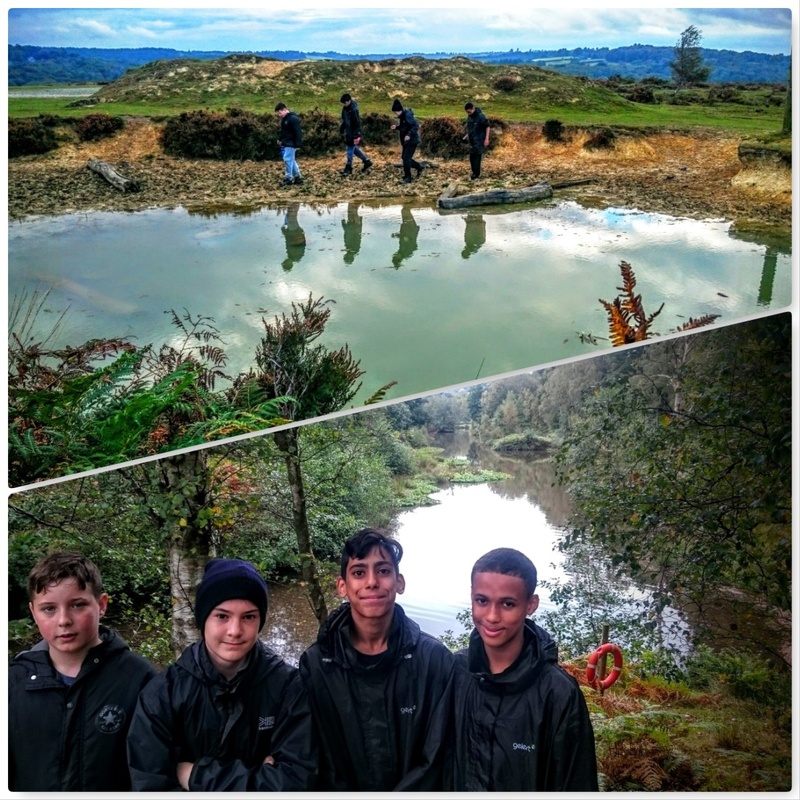 On the way back to the campsite at Ferny Crofts the way got pretty boggy so it was fun watching the cadets trying to keep there feet dry. They soon learnt how to select a good route along the way. 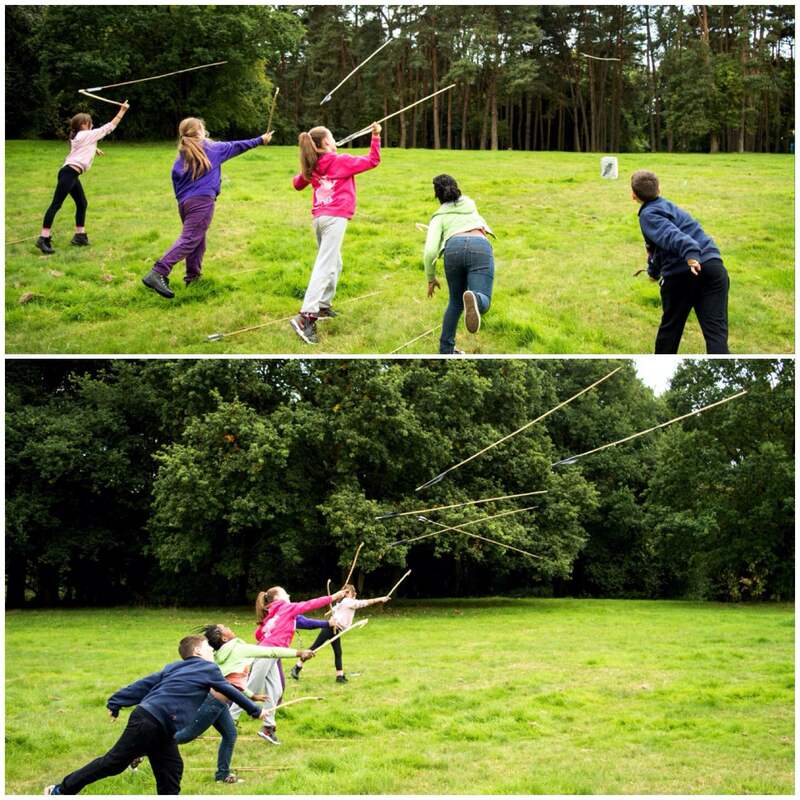 Evening activities involved the usual football, netball and run out games before it was marshmallow time. 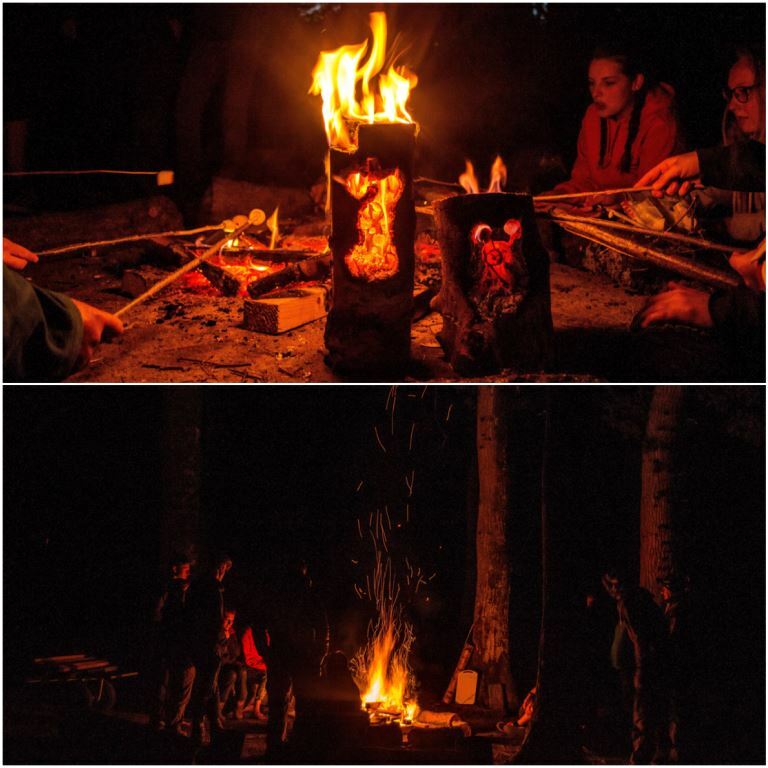 We had enough wood this year for the cadets to have their own fire and soon it was sparking away merrily. On the Sunday morning a group of cadets go off to the remembrance service at Boldre church while the rest of us get on with the mornings activities. 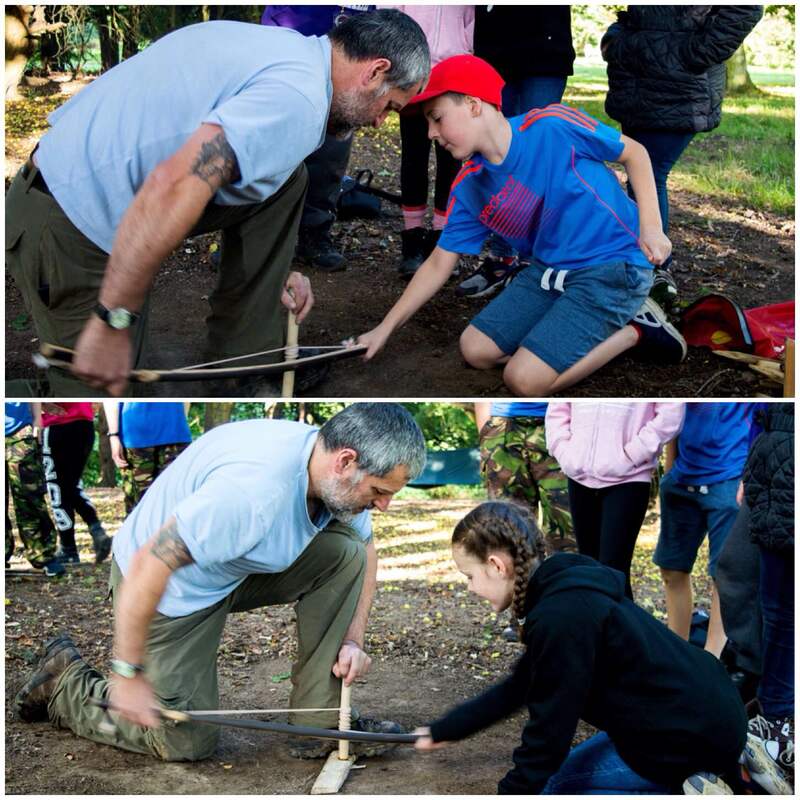 The rest of the staff and the older cadets cracked on with lots of classes. 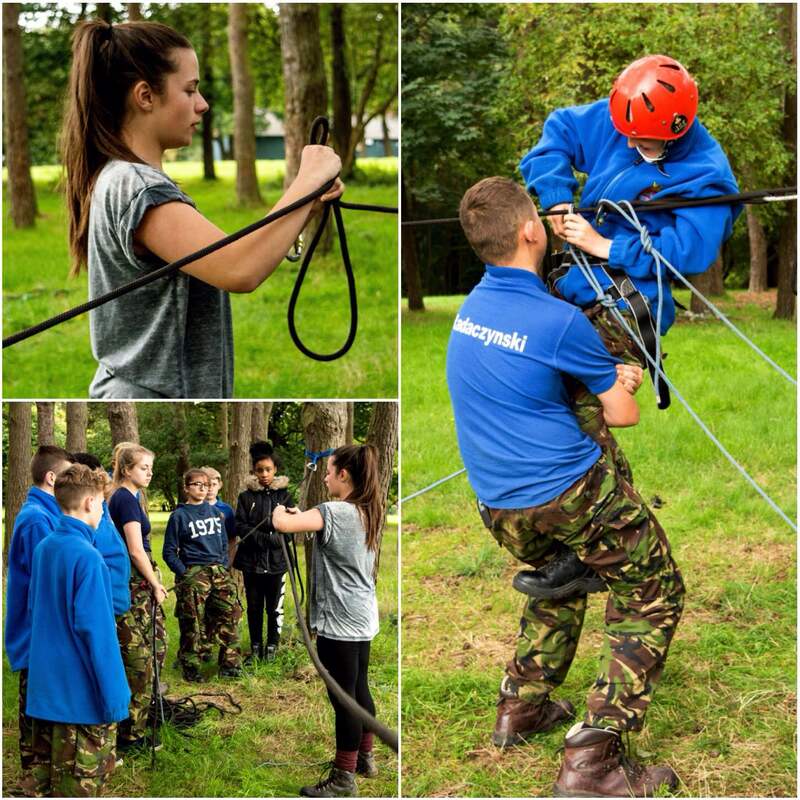 This allowed the trainee instructors like Sarah, Jess and James to gain some valuable time teaching AT skills while training up for their BEL award. 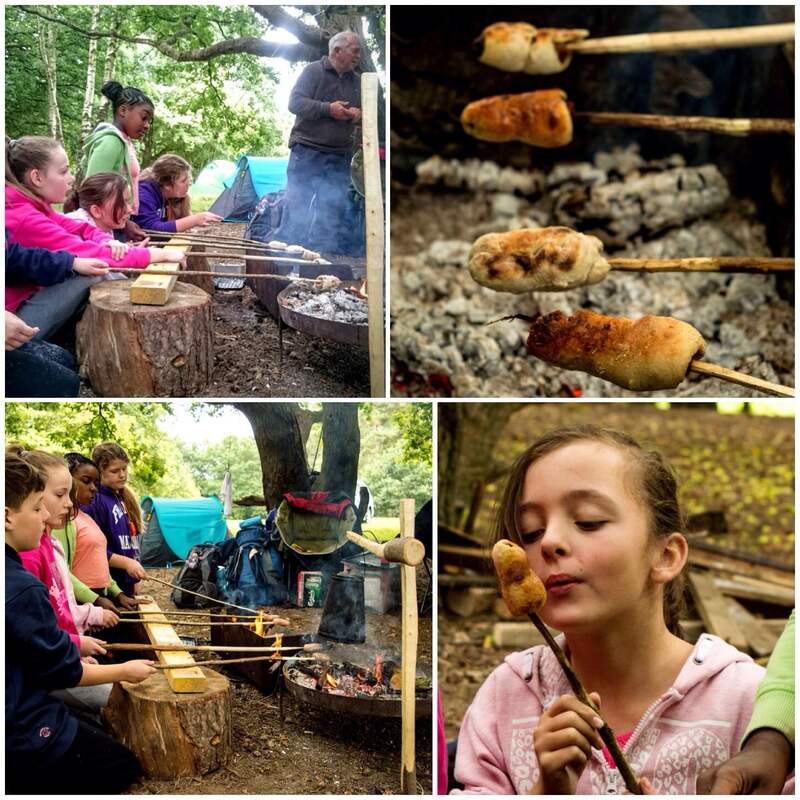 Classes included tent pitching, first aid, bag packing, cooking and compass work. 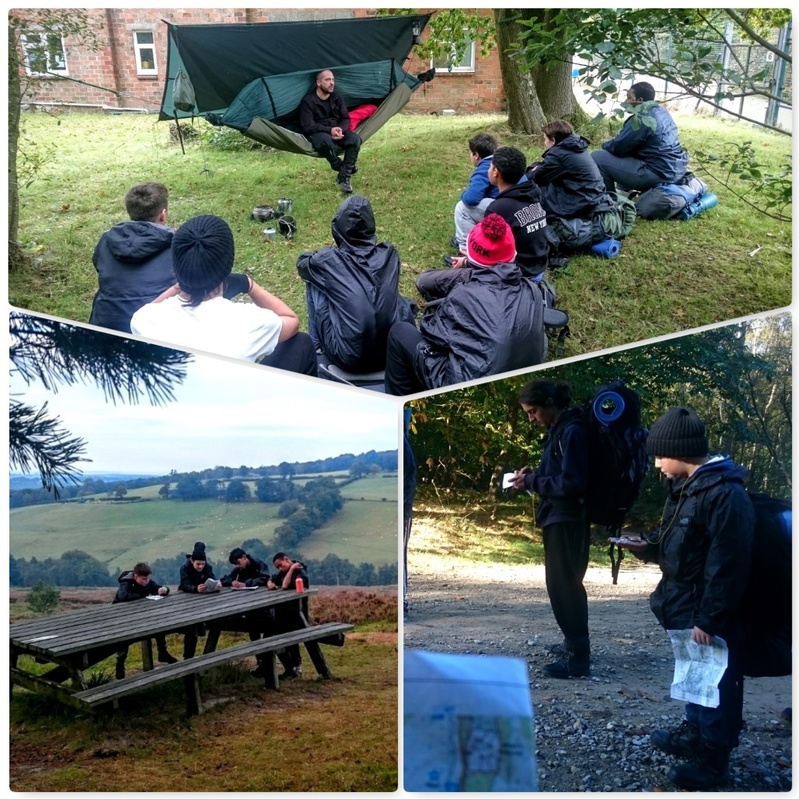 I did not see much of the DofE team as they were out on their expedition on both days however reports back were that they all successfully completed the weekend. As I get older the years seem to pass quicker however each year has been packed full of fun. 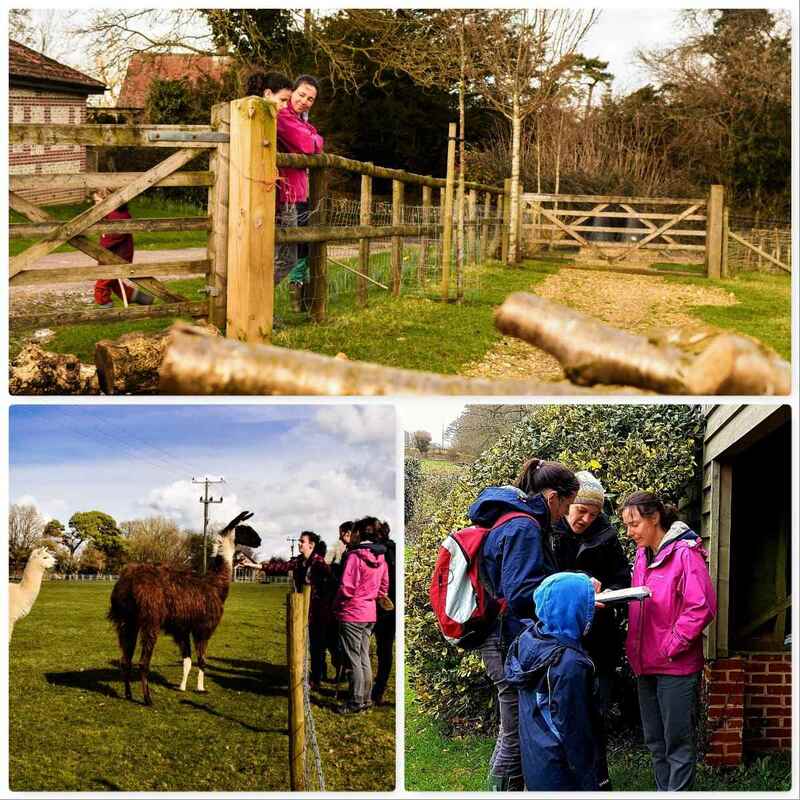 I am looking forward to many more years of visiting the New Forest and passing on my knowledge of nature to others so that they can continue this skilling up cycle. 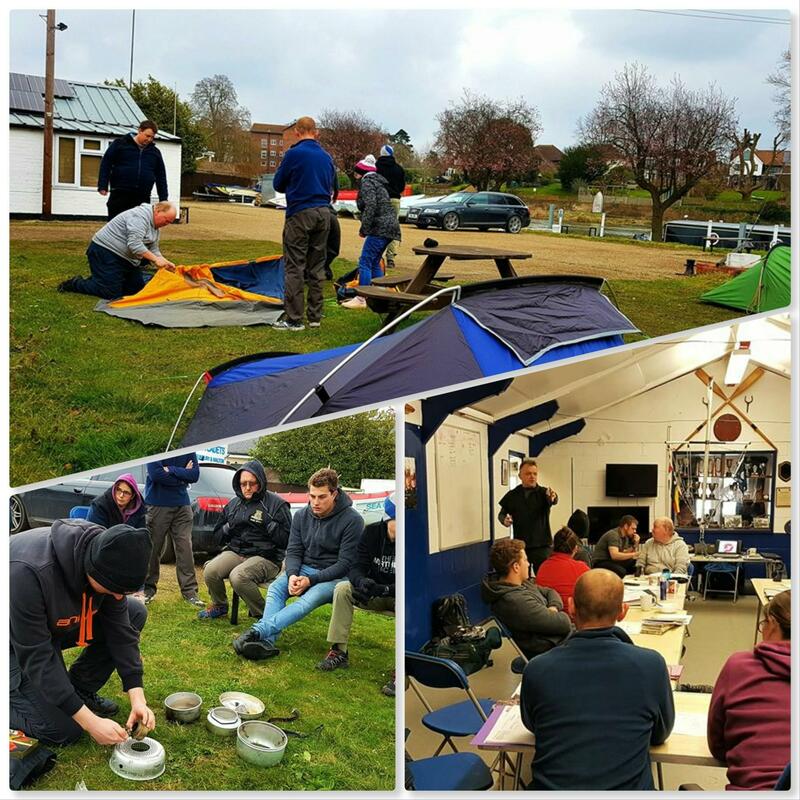 Last April it was time to start the Basic Expedition Leaders course for 2016 here at London Area Sea Cadets. 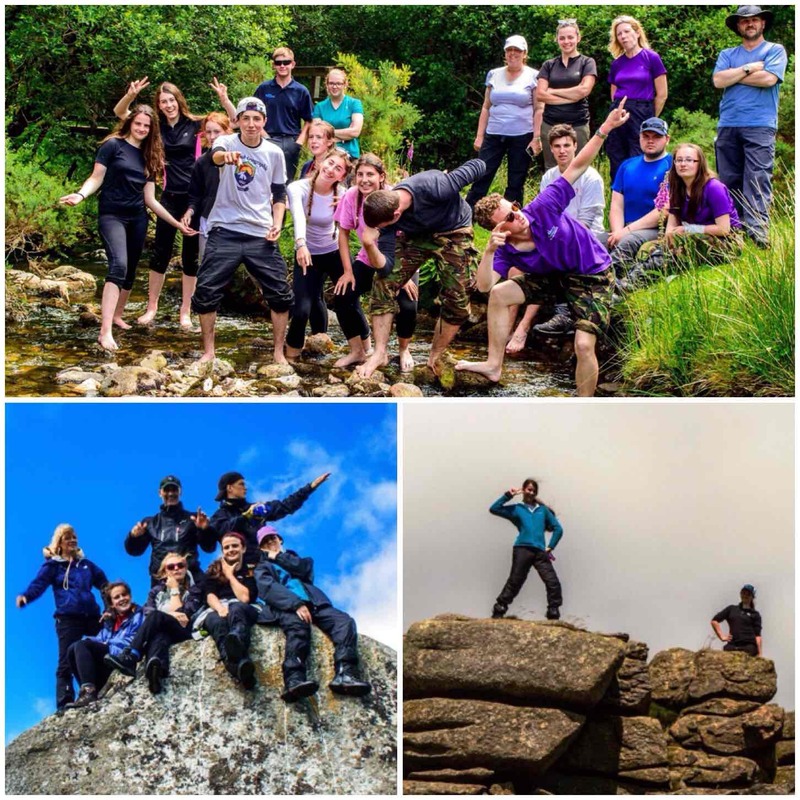 The course is spread over four weekends and the students – if they pass – get accredited by Sports Leaders UK as Adventure Leaders. 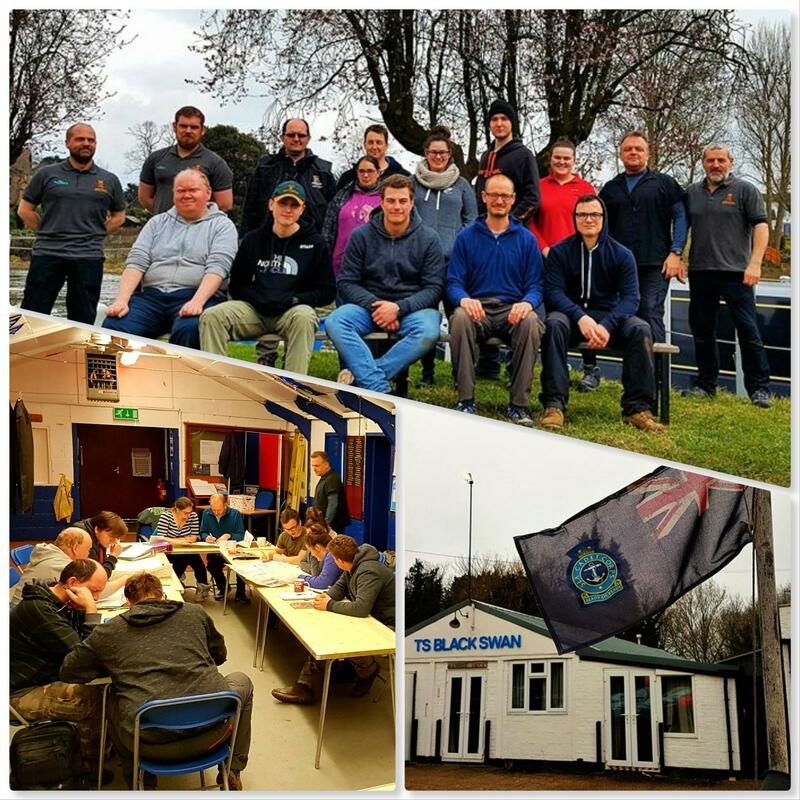 The weekend was hosted by Sunbury and Walton Sea Cadet unit (TS Black Swan) where all of the classes took place on the Saturday. The classes were run by Dave Lewis, John Kelly and myself however all the students had to deliver their own class as part of the weekend. In amongst all these classes we were well fed the whole weekend by the unit staff. 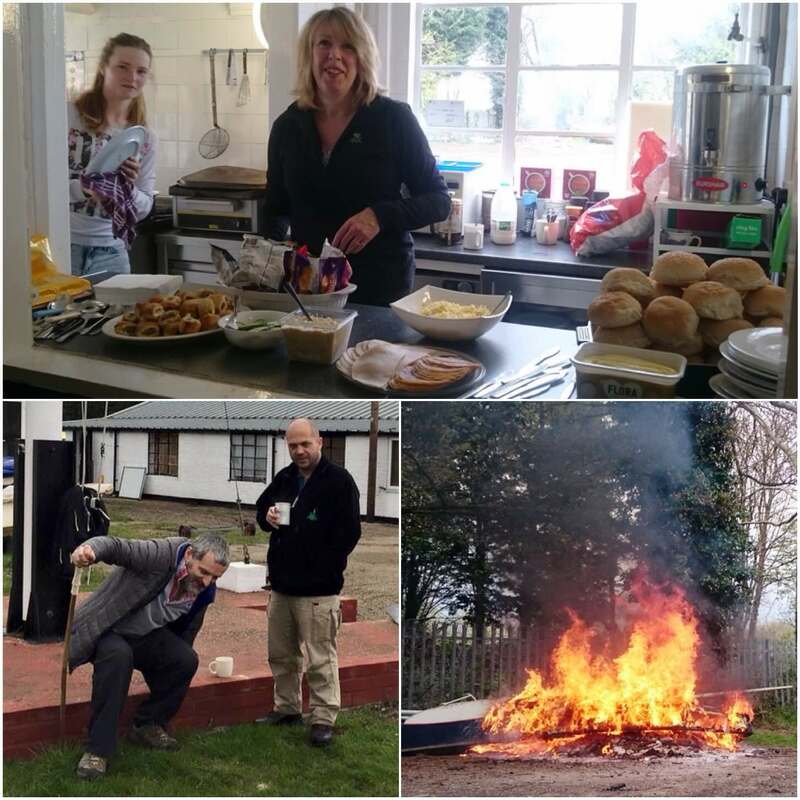 This onsite catering allowed us to really concentrate on all the classes (one less chore to do) so thanks to everyone who helped. I had ripped a muscle in my calf a few weeks earlier (never go trampolining with your kids!!) and thought it was healing well. Needless to say, within 5 minutes of arriving I managed to re-open the rip so spent the rest of the weekend hobbling around. 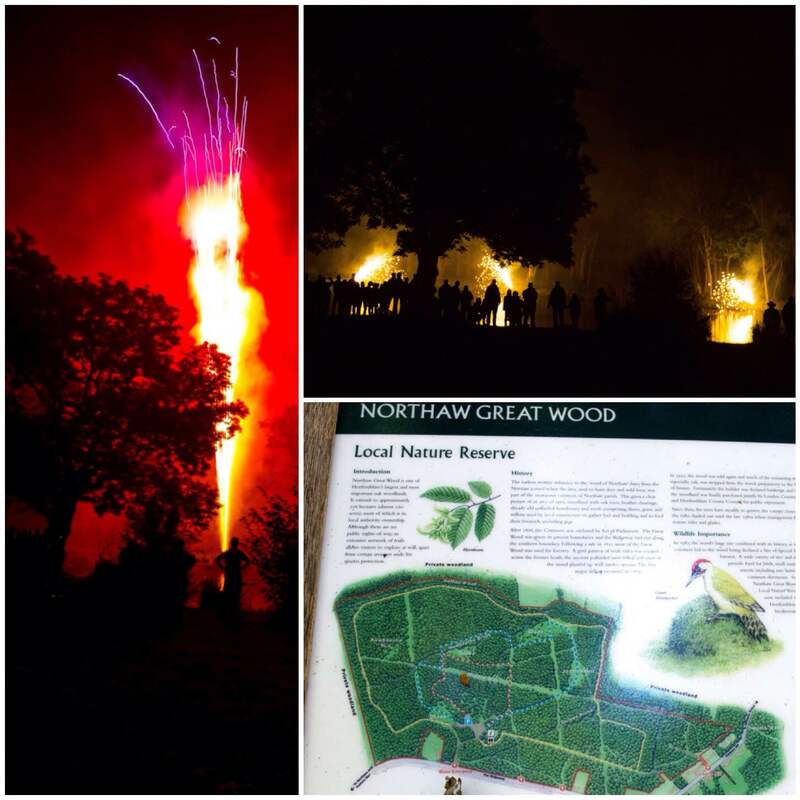 I did enjoy the unit bonfire though as they burned some old boats. 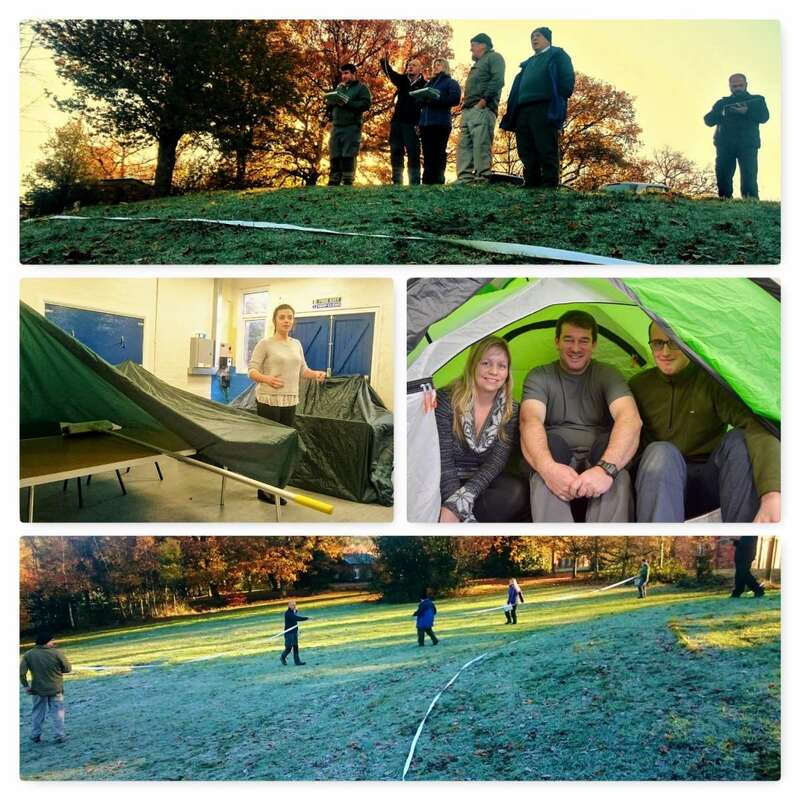 There were many classes from navigation to the law but quite a few hands-on ones such as learning about different tents. 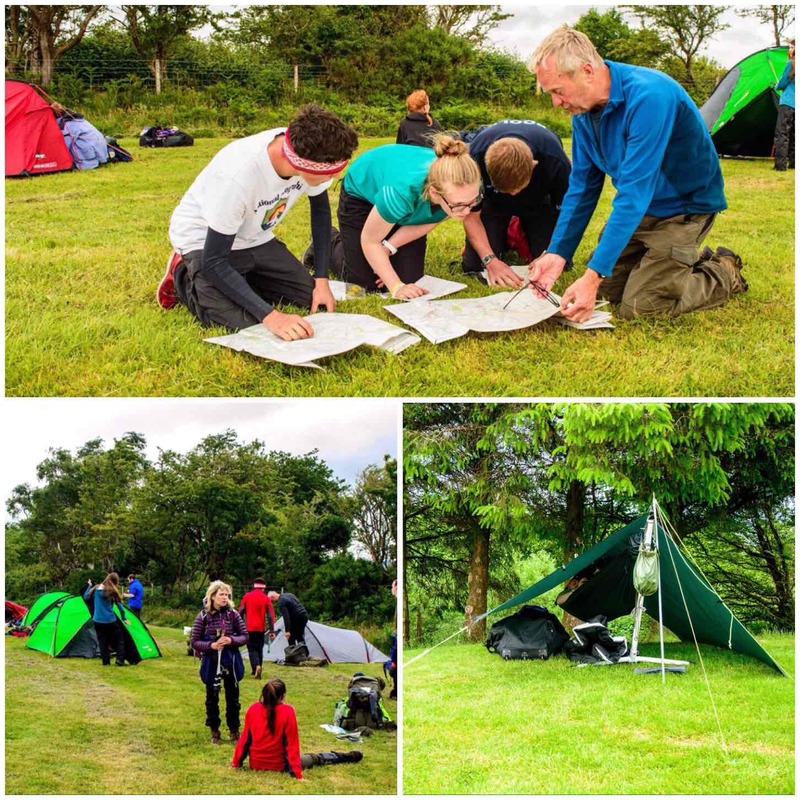 It is crucial that Adventure Leaders are proficient in putting up a wide a range of tents as they’ll be faced with all sorts of different types when they’re teaching cadets. I did not get out on the Sunday on the navigation exercise because of my gammie leg, however I did get a great picture of the Swans on the slipway by the unit. 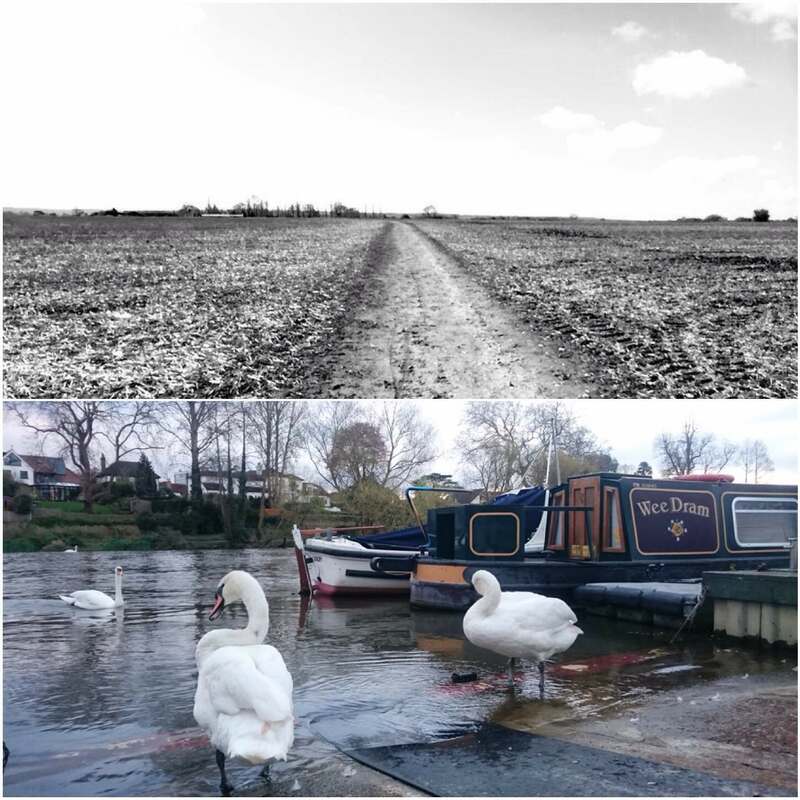 Jess Edwards took the top picture below (taken on the North Downs) and its simple beauty lent itself well to black and white. On the Sunday morning I headed home to rest up but the guys all struck out for the North Downs. They had a morning of intense instruction from John and Dave. They needed it, as they would soon be taking the cadets out and about. 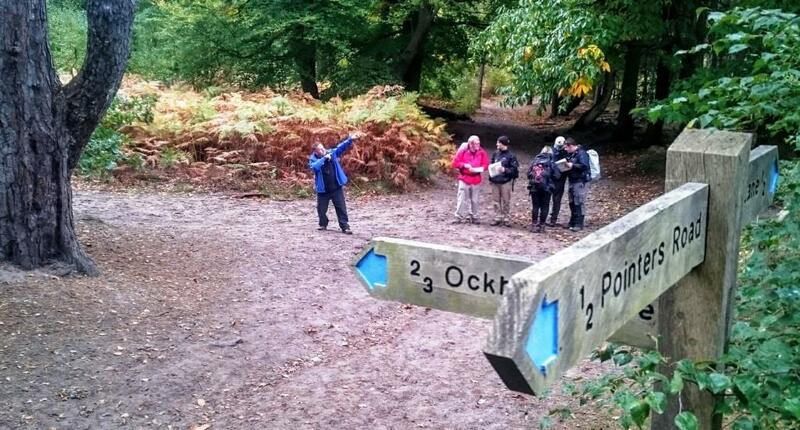 The next weekend on the course was last month in the New Forest and that report will be up soon. 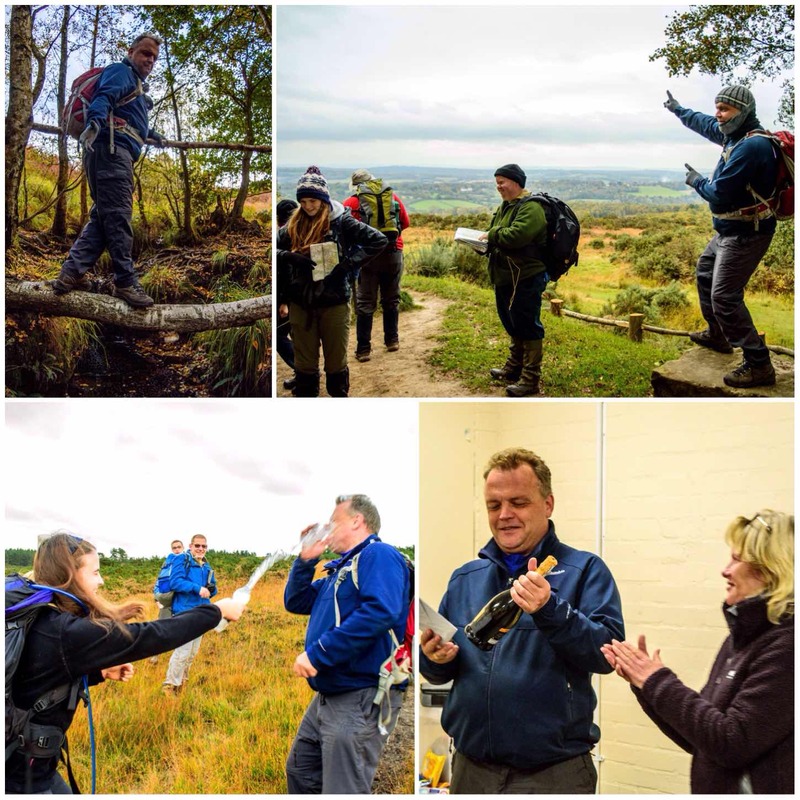 On a cold but dry weekend last October Sea Cadet staff and cadets assembled in beautiful Ashdown Forest for the finale of the Basic Expedition Leader (BEL) course. 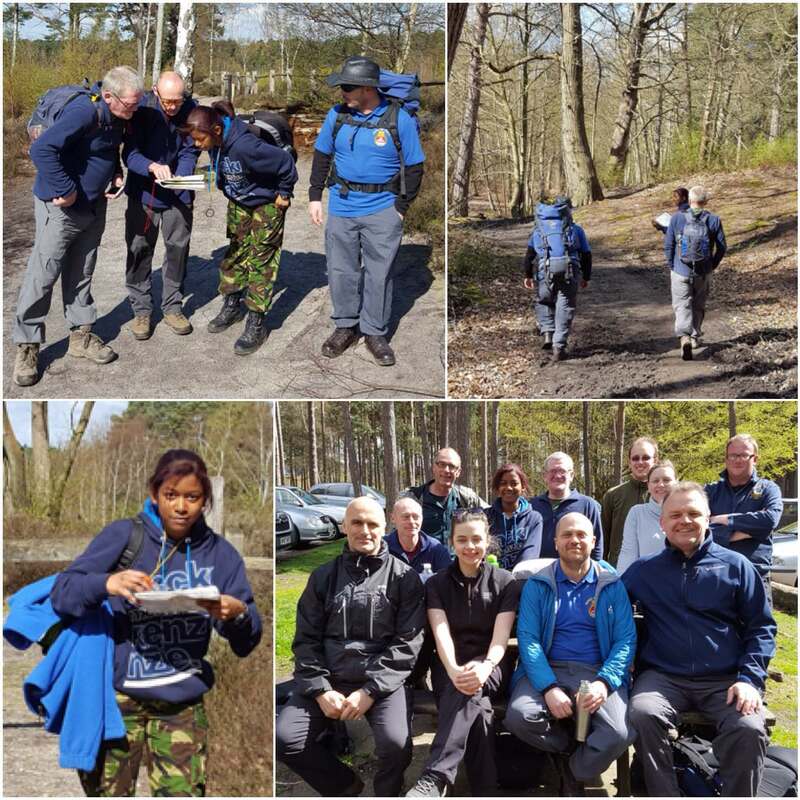 This was a weekend of assessments for the staff and a weekend of learning for the cadets. 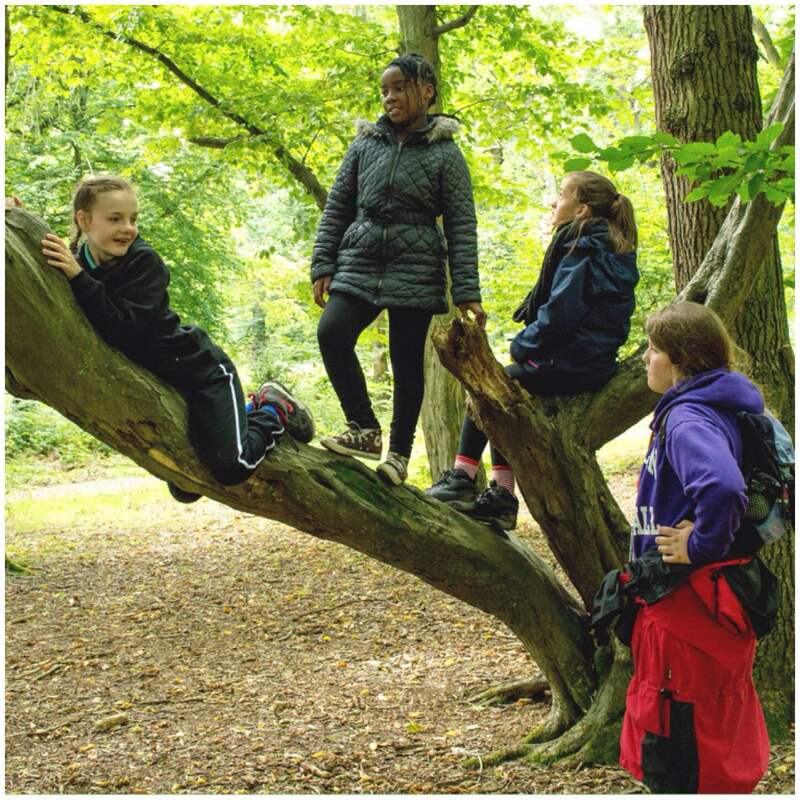 The BEL award is a nationally recognised qualification in outdoor leadership and comes under the banner of the Sports Leader UK Award. 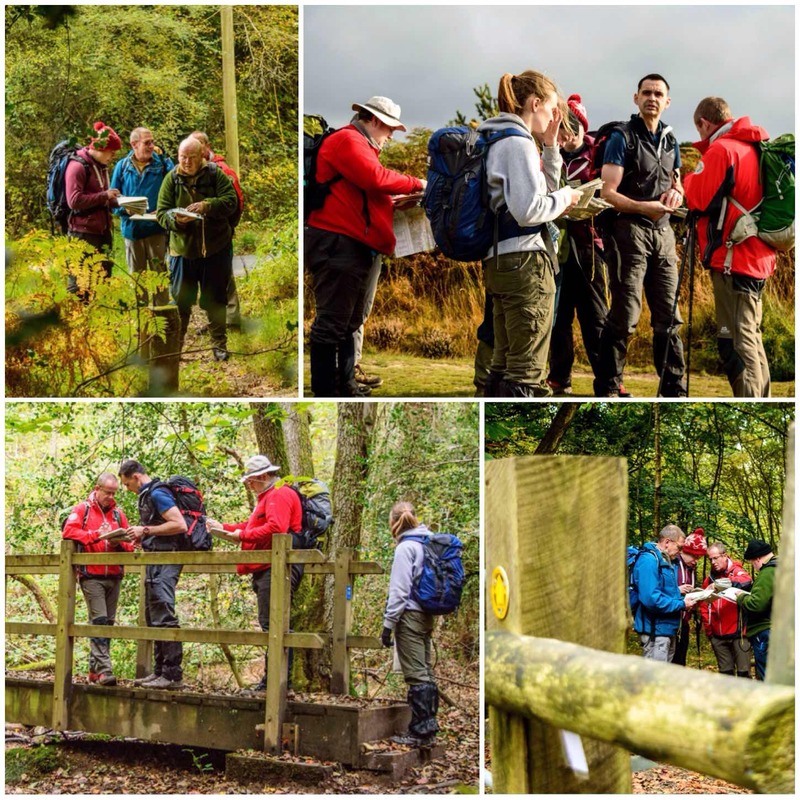 The trainee instructors have to attend three weekends of training and put in many more hours’ work on their leadership and navigation skills. 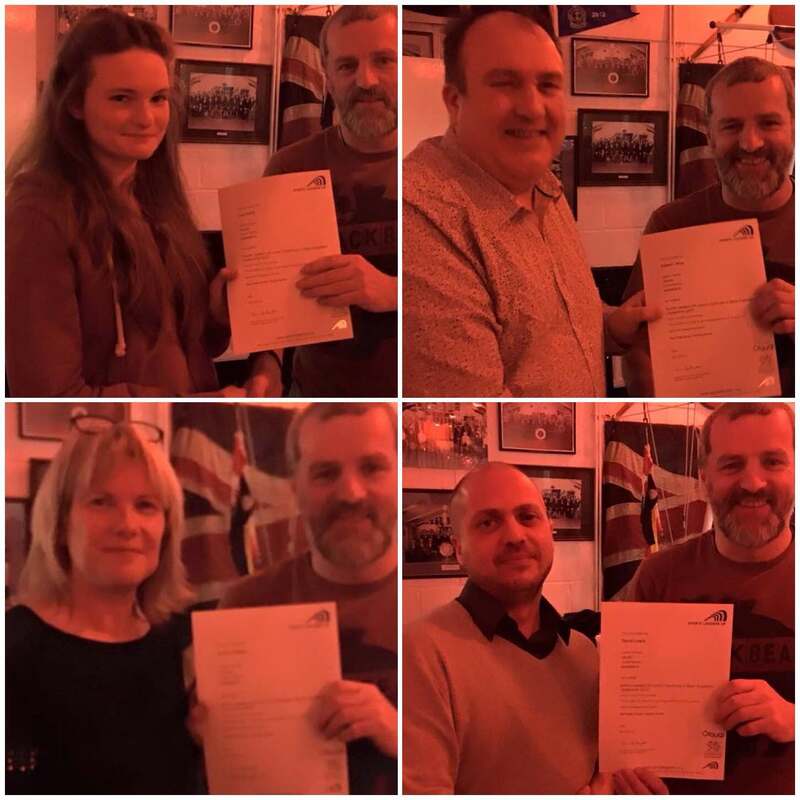 For the assessment we brought in an independent assessor who had never worked with the students before and we also had another observer from the Sports Leader organisation along to see that we ran the course to the correct standards. 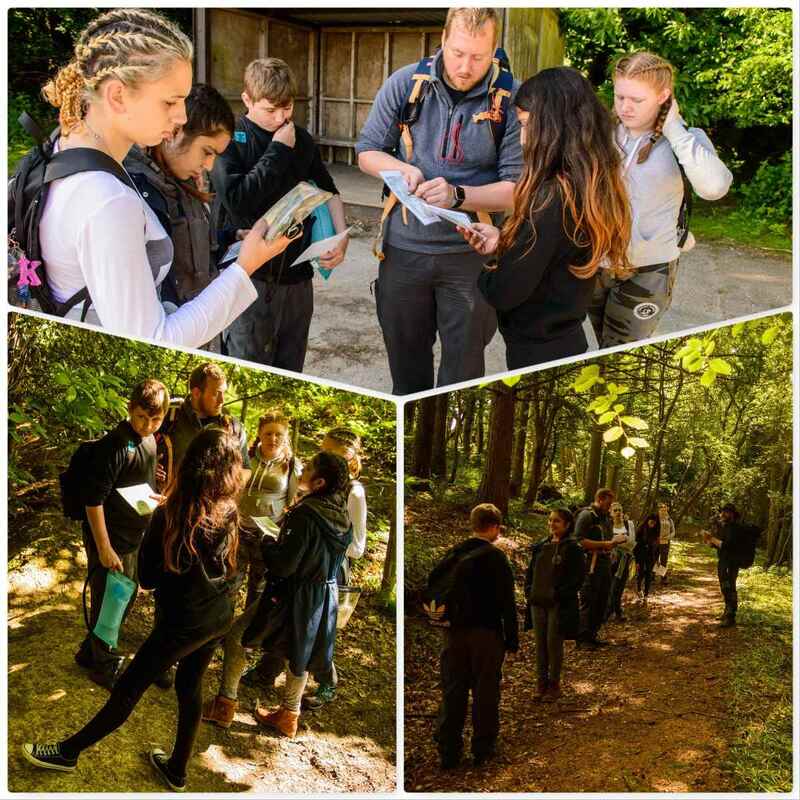 Much of the weekend was spent observing the students’ navigational skills as these have to be to a high standard. Not only do they need to know how to use a map and compass they need to be proficient in teaching others this skill. 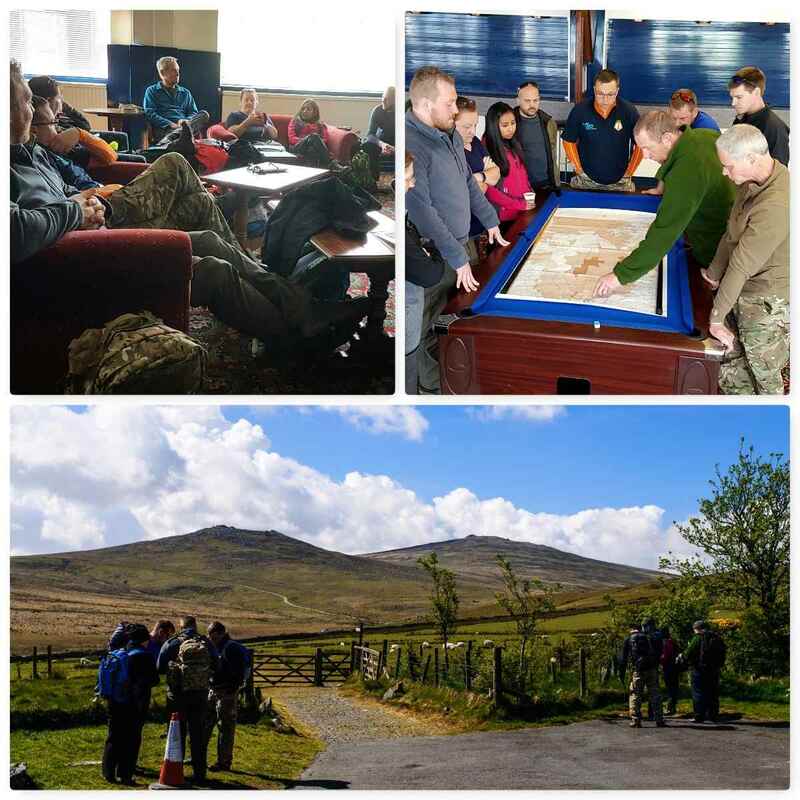 Interspersed with the navigation tasks the students had to give lectures and run classes in different subjects to each other and the cadets. 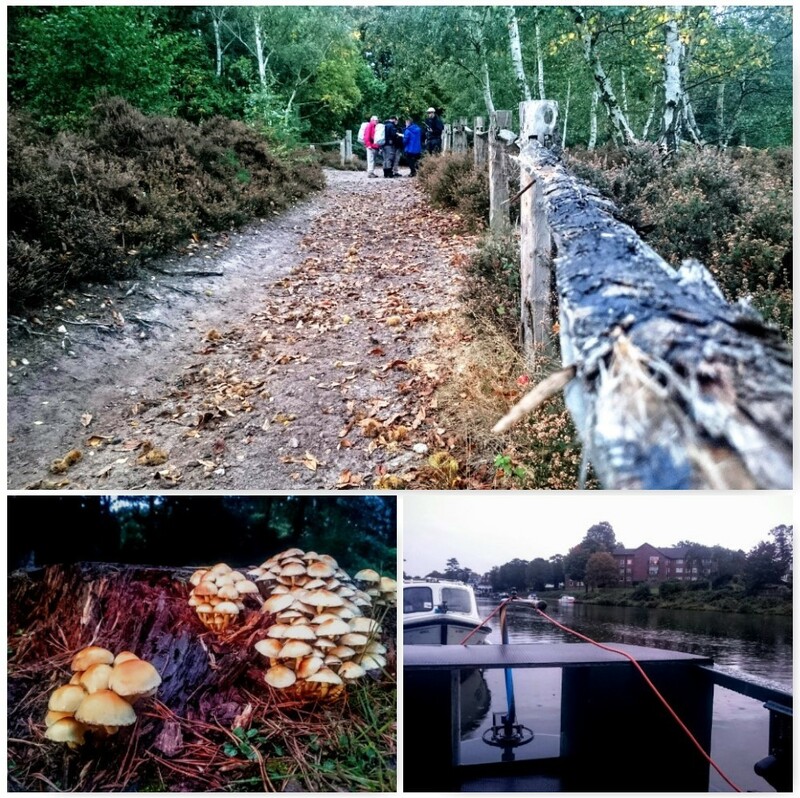 We were very lucky on the weekend to have a keen bunch along from Sunbury and Walton Sea Cadets. This made the assessment much more realistic and was a good reminder to the students as to why they were looking to gain the qualification. It is not all about navigation and leadership though. 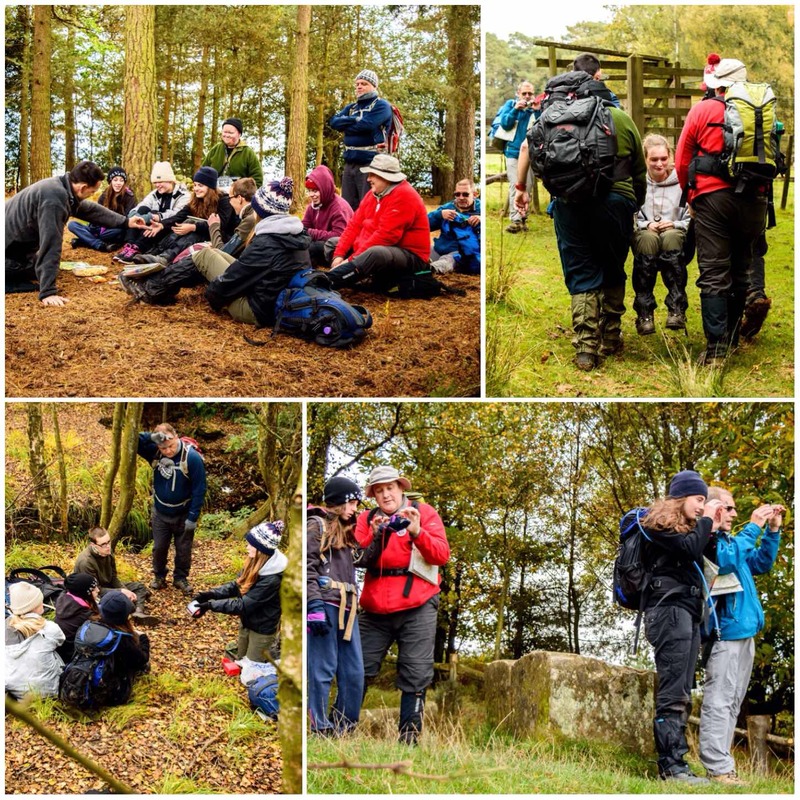 The assessment also tests the students on their knowledge of group management, risk assessing, camping, clothing/kit and the environment. 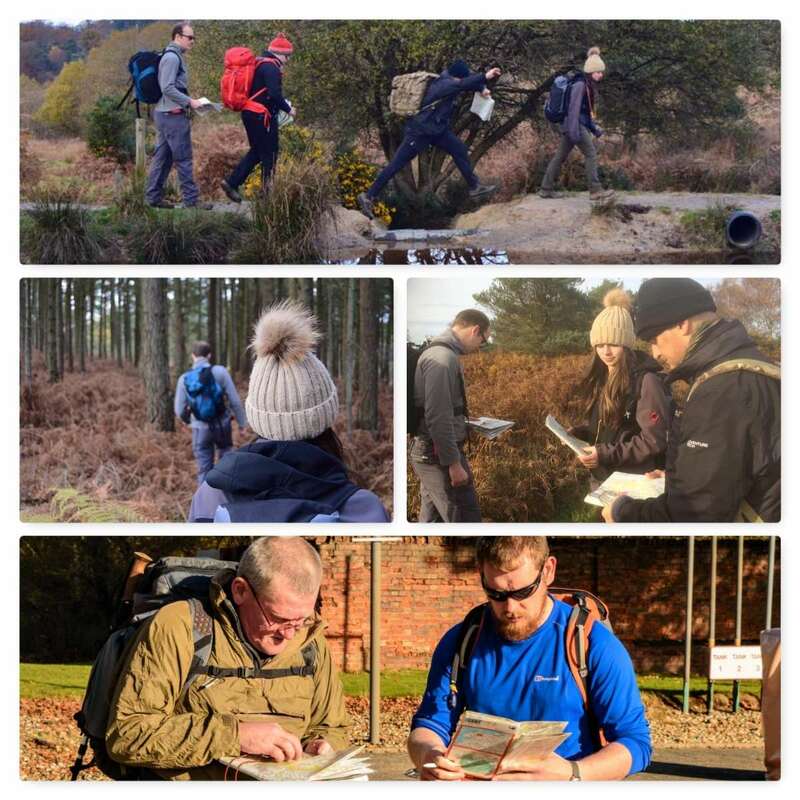 It is all well and good to be able to read a map and teach that skill but being an Adventure Leader is about a whole lot more. 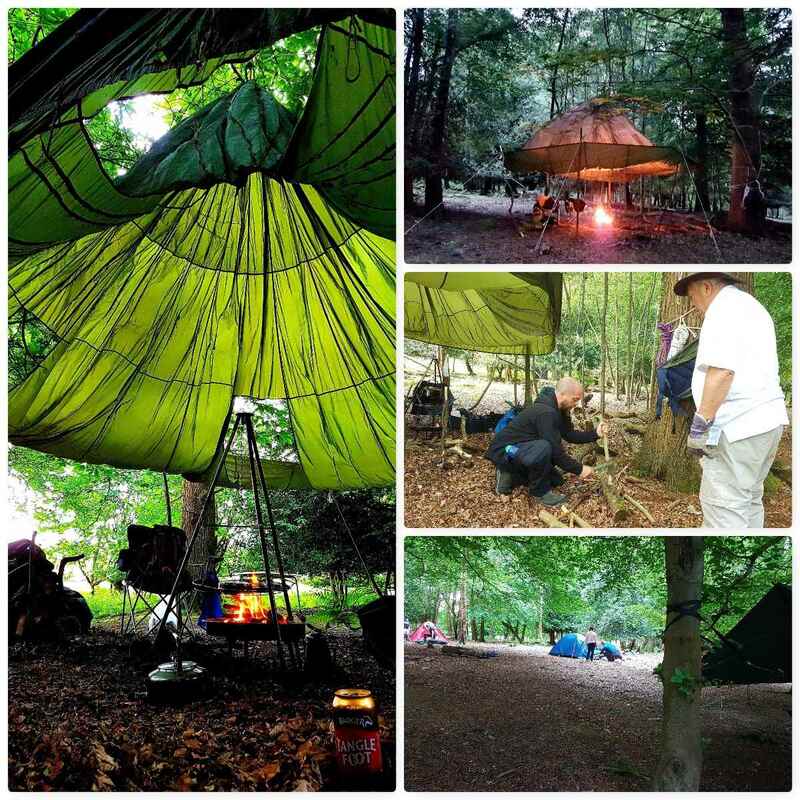 It is about being comfortable and knowledgeable in the environment you find yourself in, and having the skills to make the learning experience for the cadets as varied, enjoyable and stretching as possible. 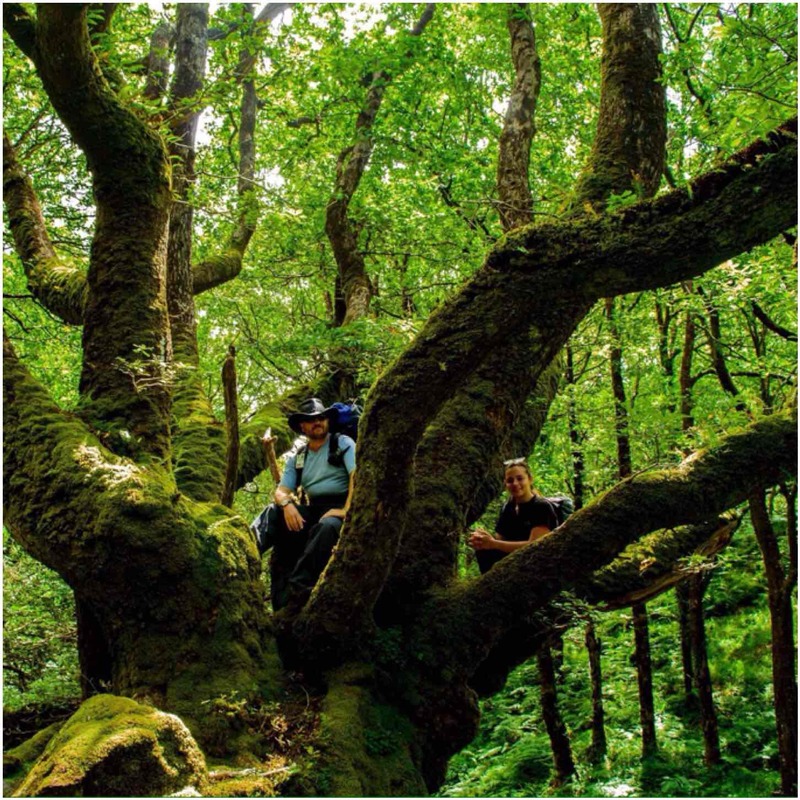 This has to be done in a safe manner however the instructor must stretch the students enough so that they feel that adventurous spirit that draws us outdoors in the first place. 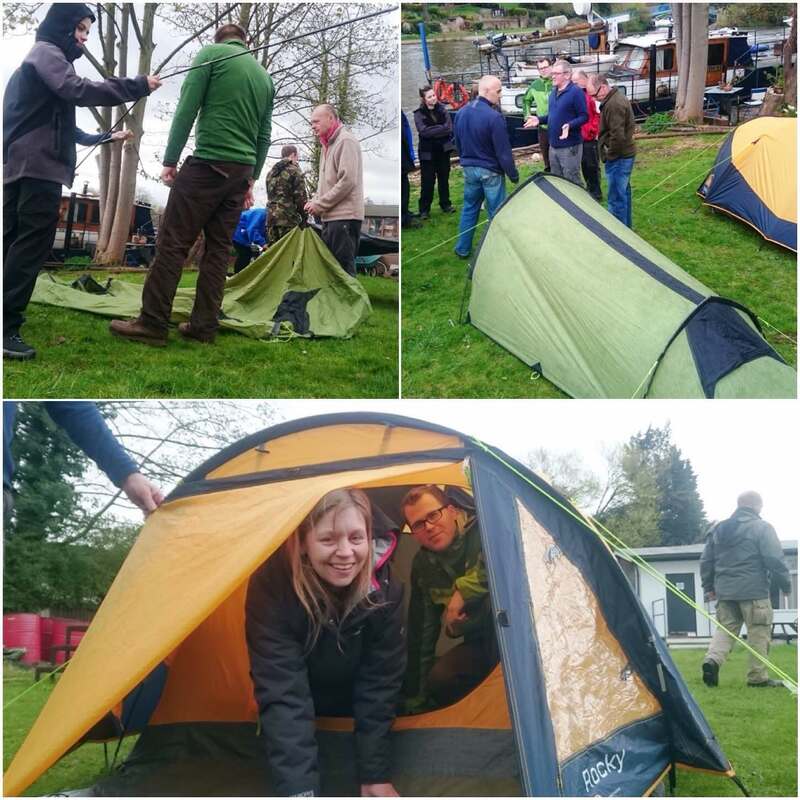 We had a number of staff along for the weekend who have decades of experience in the outdoor environment including Perry Symes (International Mountain Leader), Duncan Boar (International Mountain Leader) and our very own John Kelly (Hill and Moorland Leader). 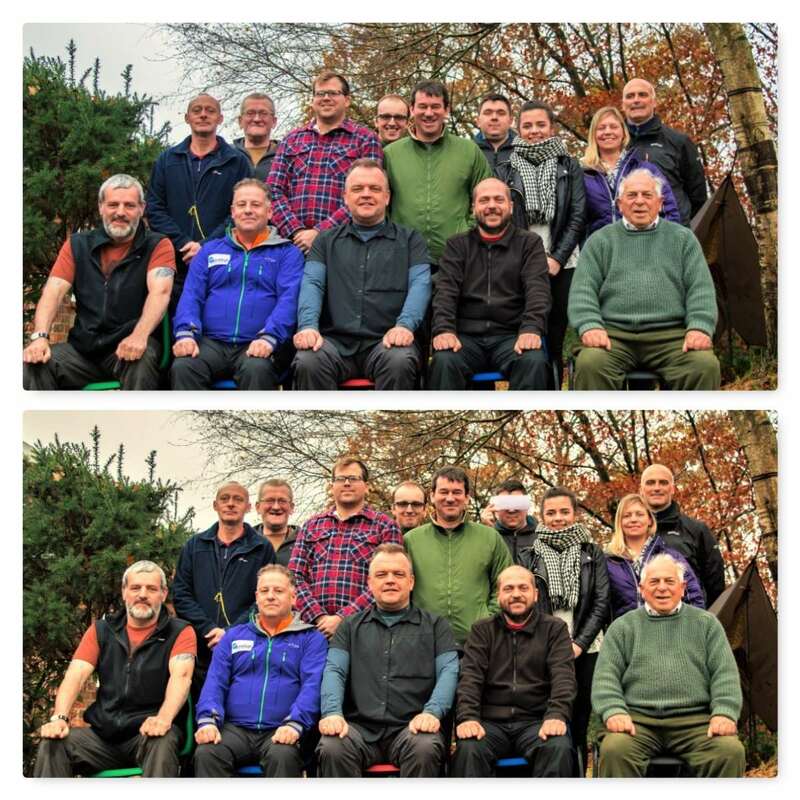 John was on our very first course as a BEL student in 2010 and has since gained his Hill and Moorland Leaders award. John takes over running the BEL course from me this year and has the same sense of adventure but far better administrative skills than me so organising future courses should be a doddle for him. The champagne picture on the bottom right was when he was presented the bottle on the news of his recent engagement to Samantha and the soaking was from his daughter who he had teased just a bit too much. 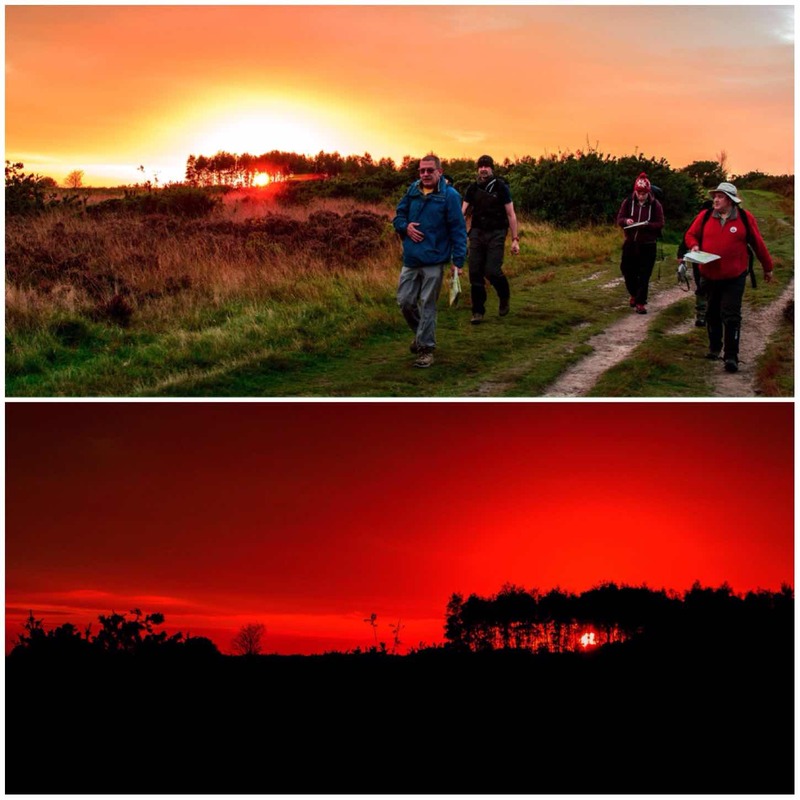 One thing about this weekend was the beautiful evenings as the sun set over the Forest. The students were a bit too caught up in their navigational assessments to really appreciate them but I sure did. Along the way I did spot some lovely colours in the environment around me. 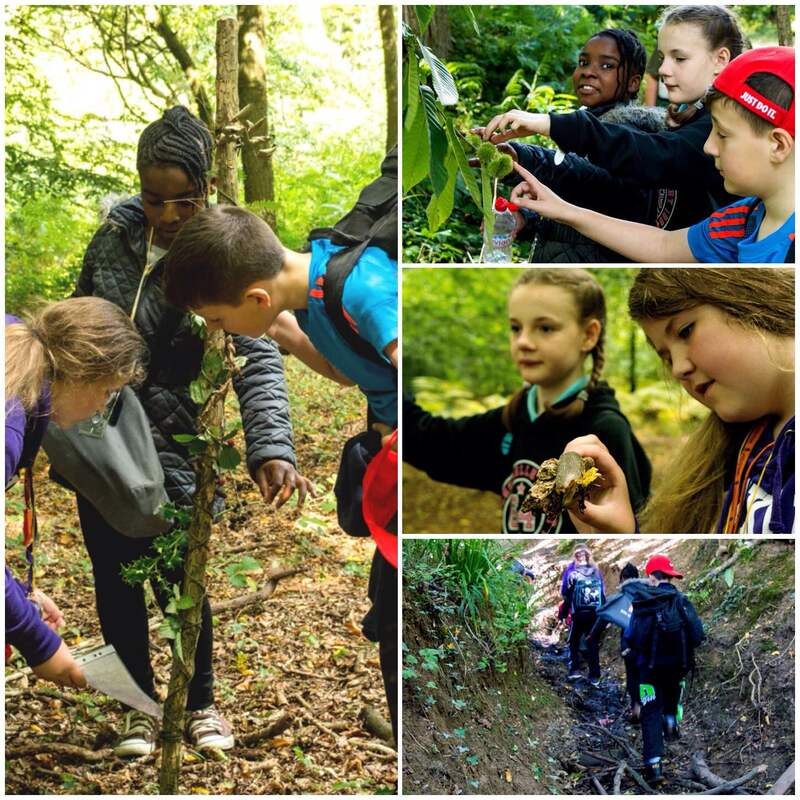 I do not expect the students to be expert in identifying plants, fungi, animals or insects but I do expect them to be able to name some trees, flowers and have a basic knowledge of the history of the area they are working in. 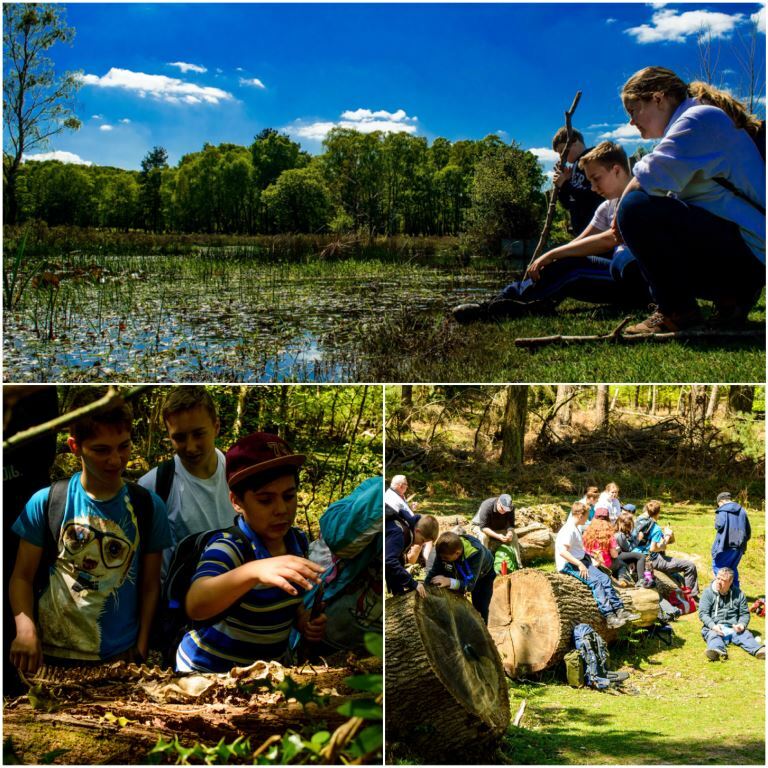 Having this basic knowledge allows them to come across as a well-rounded Adventure Leader to their students and means more fulfilling and educational walks. 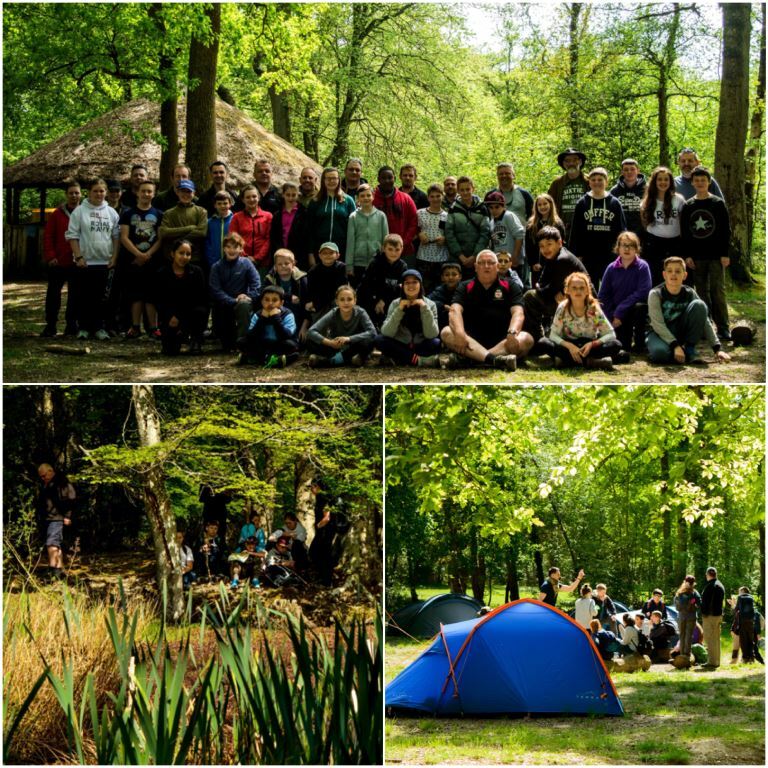 So after a lot of hard work over about 6 weekends the majority of the students reached the standard of Level 3 Basic Expedition Leader Award from Sports Leader UK. A number of the students received their certificates at the Walton and Sunbury Sea Cadet Unit recently. There are a few more who just need to finish their final assignment and then they can be awarded their certificates. 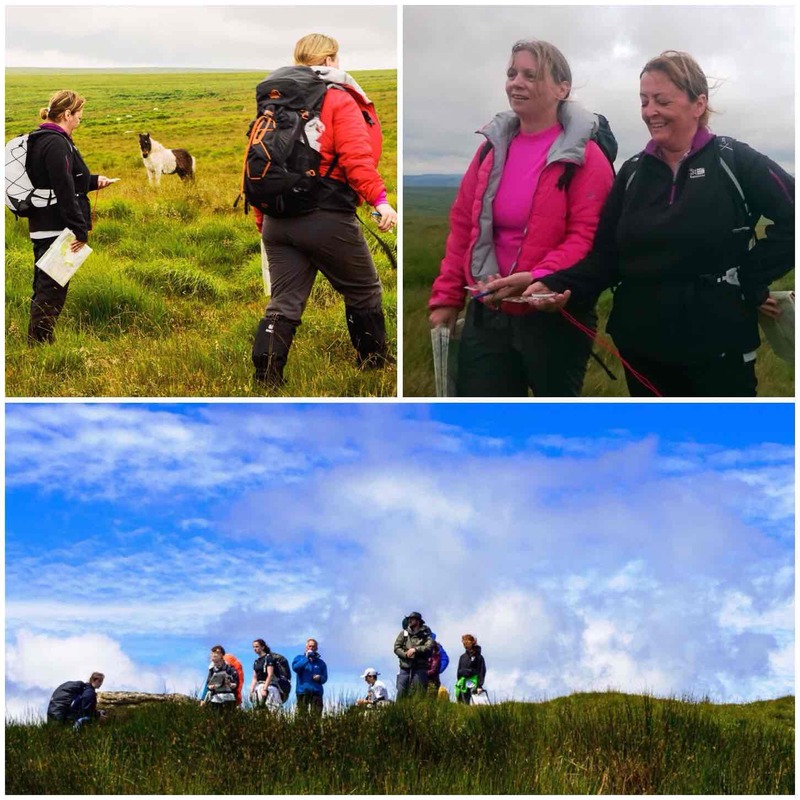 I am looking forward to helping out once again in the BEL course this year as an instructor and assessor but thankfully JK is taking the reins in terms of organising it allowing me to do more of what I like – Getting out and Adventuring.